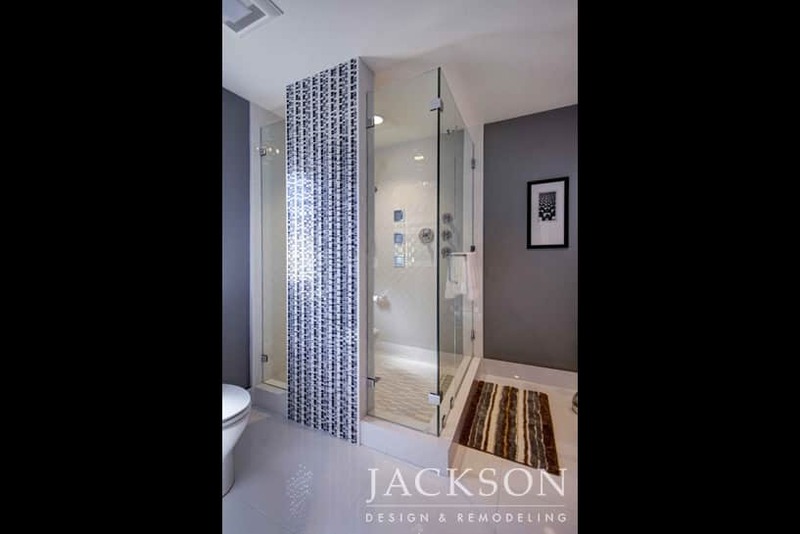 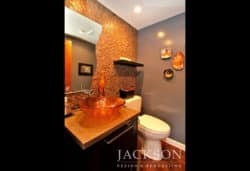 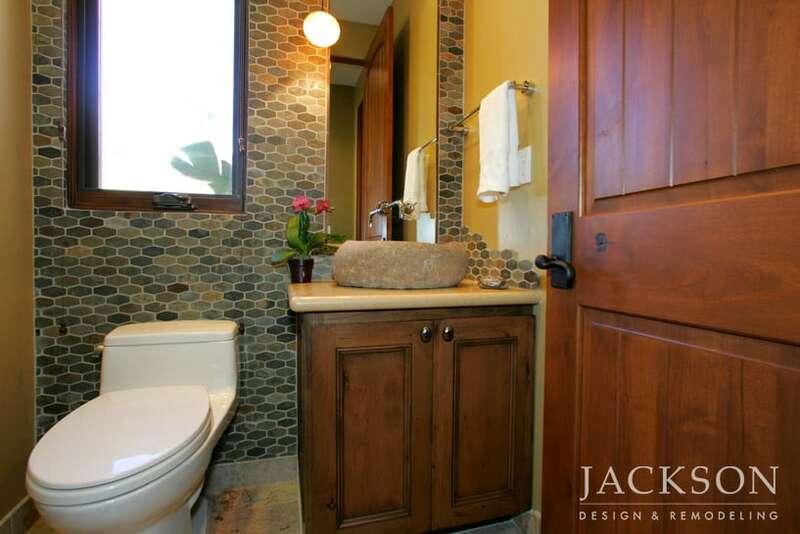 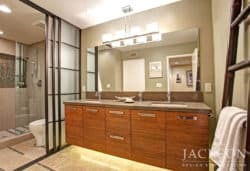 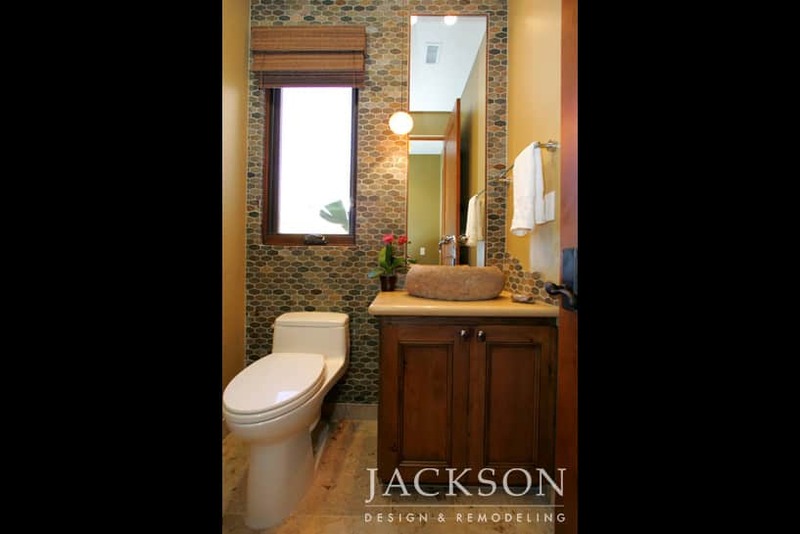 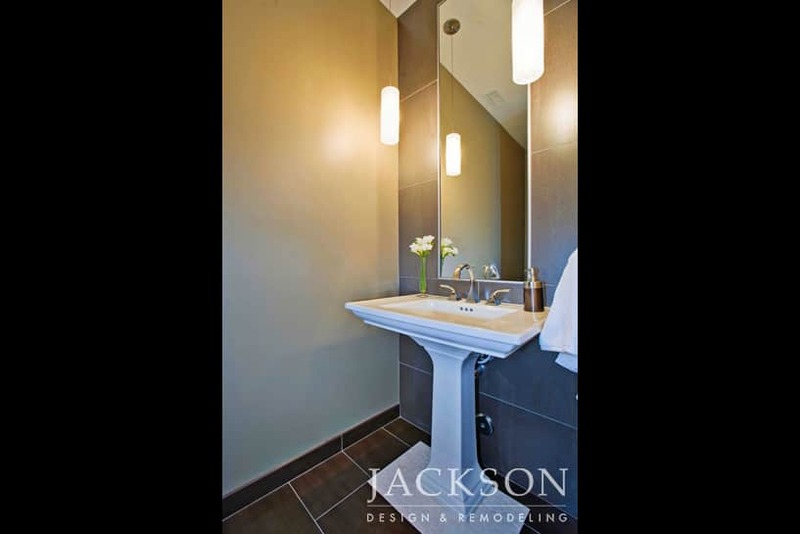 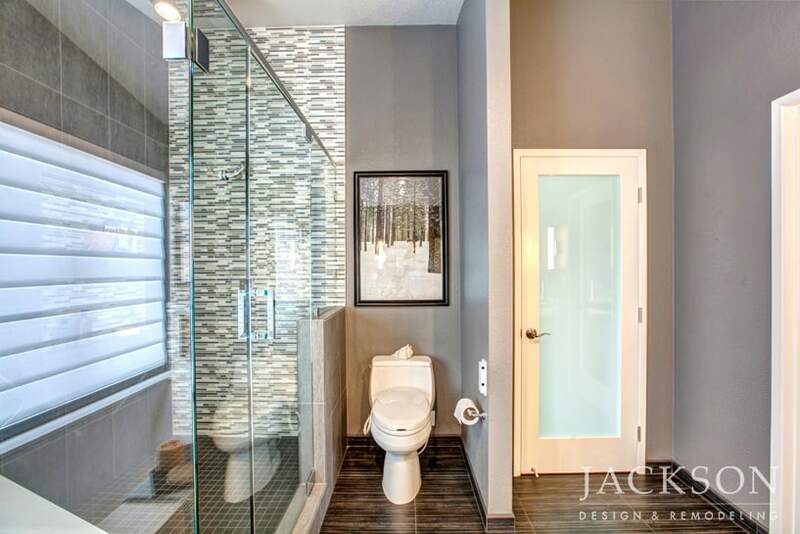 Transitional bathroom design fuses the contemporary and traditional, while contemporary bathrooms celebrate the modern. 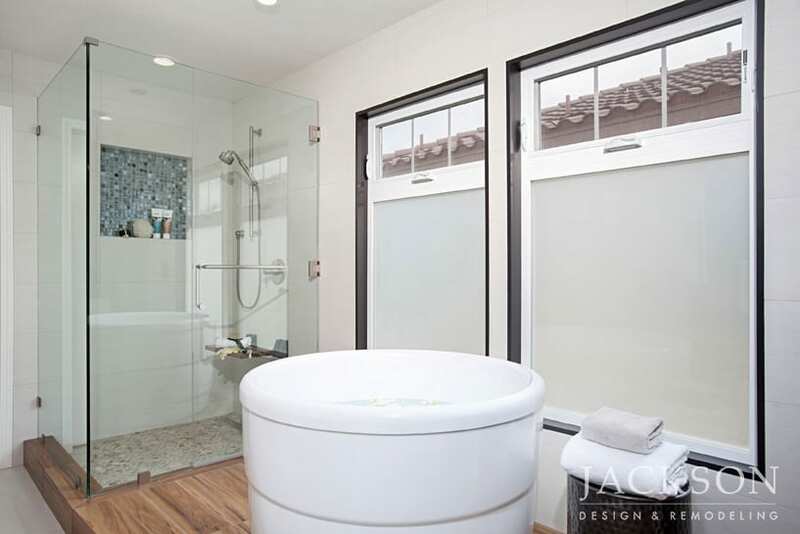 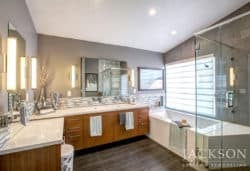 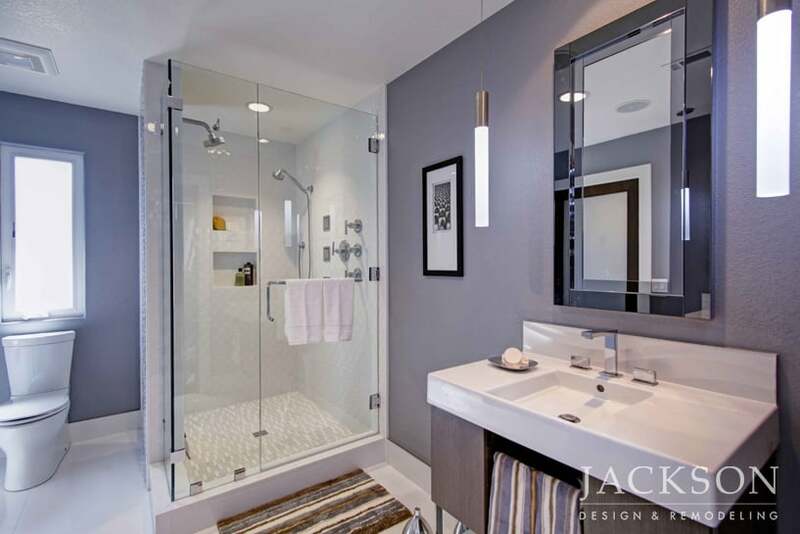 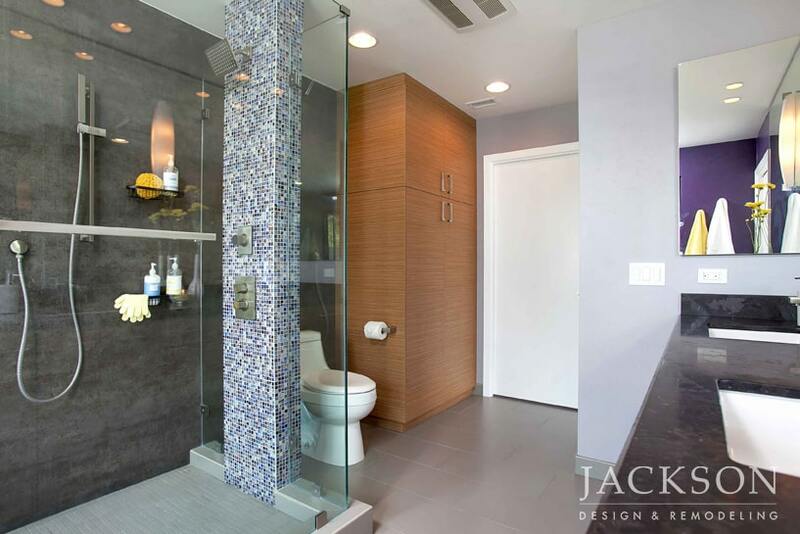 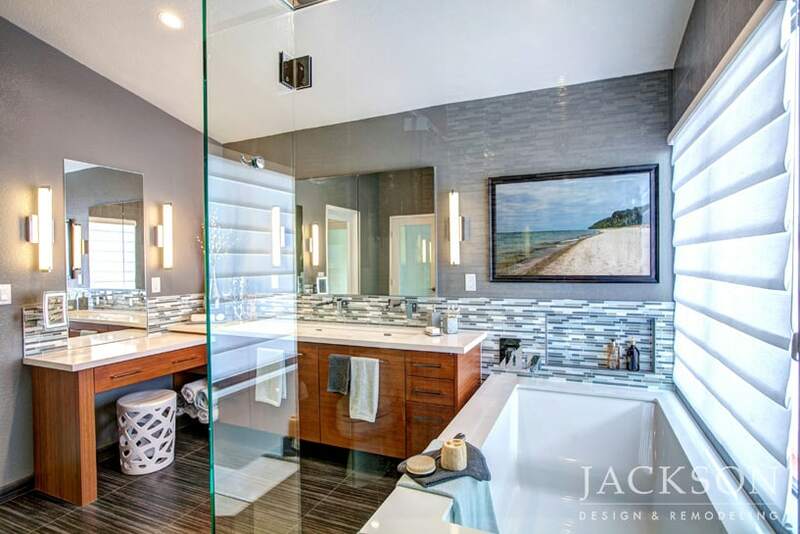 Whichever style is right for you, our unified team of architects, designers and construction professionals will create a bathroom that realizes your vision for your home when you are looking for San Diego contemporary/transitional bathrooms. 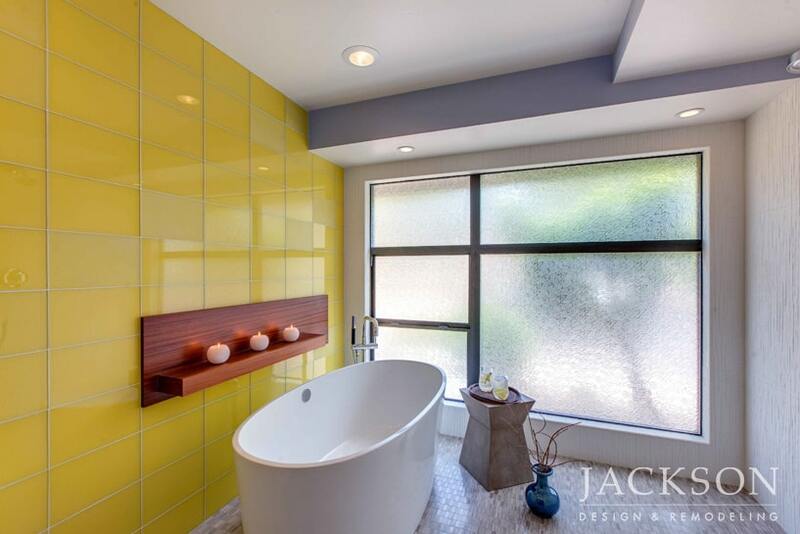 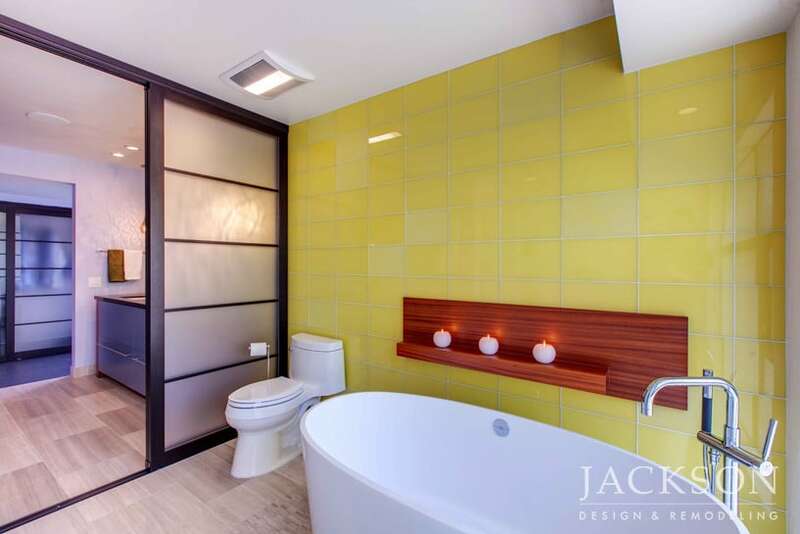 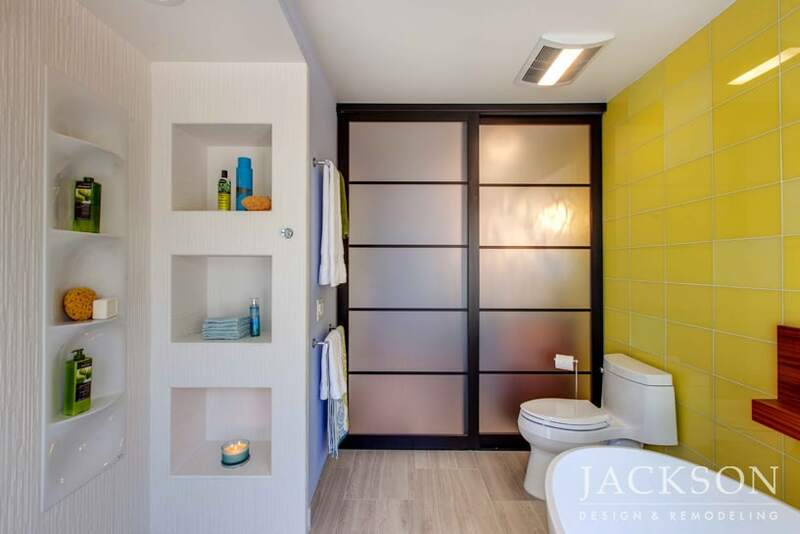 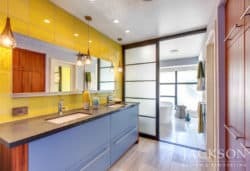 In this national award-winning bathroom, a daring combination of yellow and blue and a design awash in natural light create a visual delight. 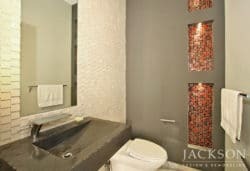 The sleek free-standing tub and an open shower with tiles in a mid-century pattern further a sense of sumptuous oasis. 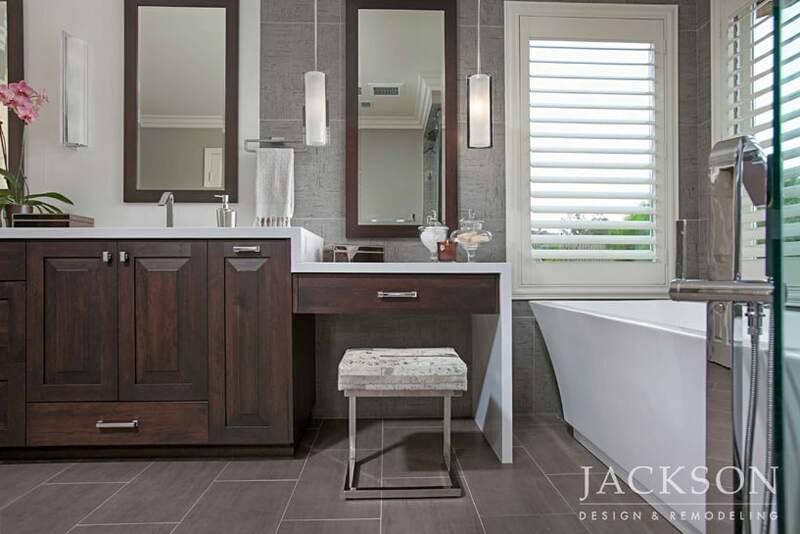 Epitomizing a home spa, this luxurious master bathroom achieves its tranquil vibe with serene colors, sensuous materials and a focus on natural light. 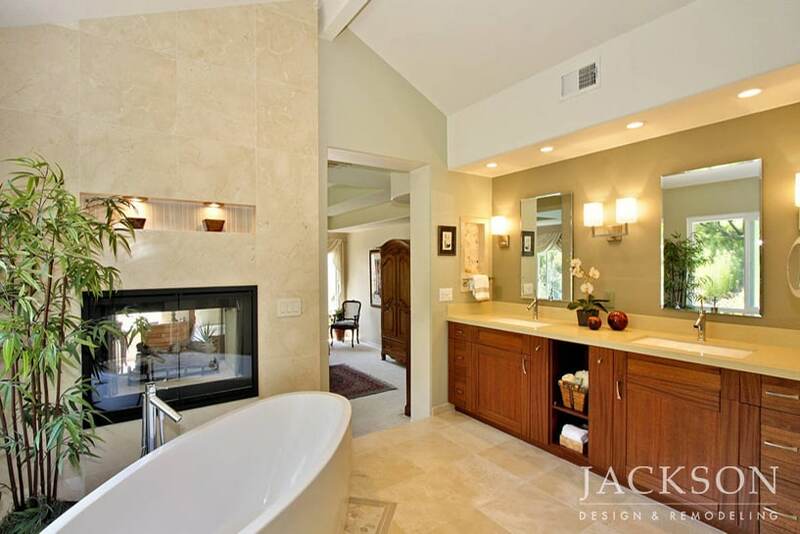 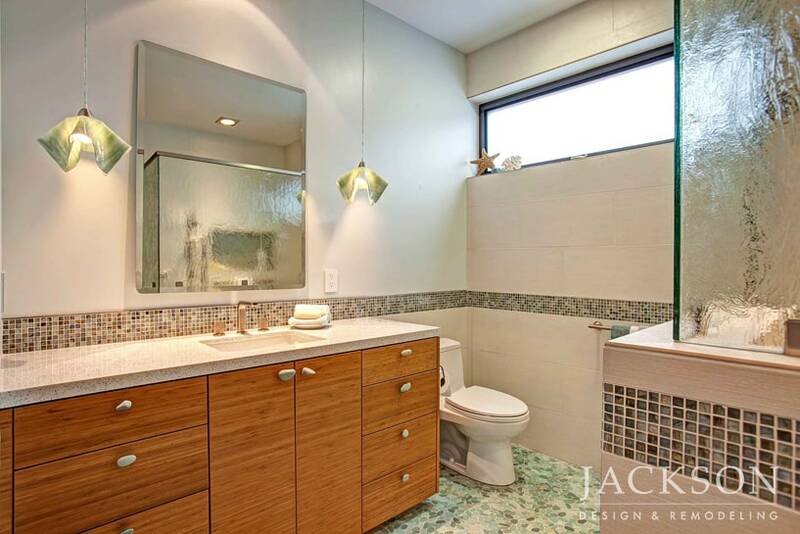 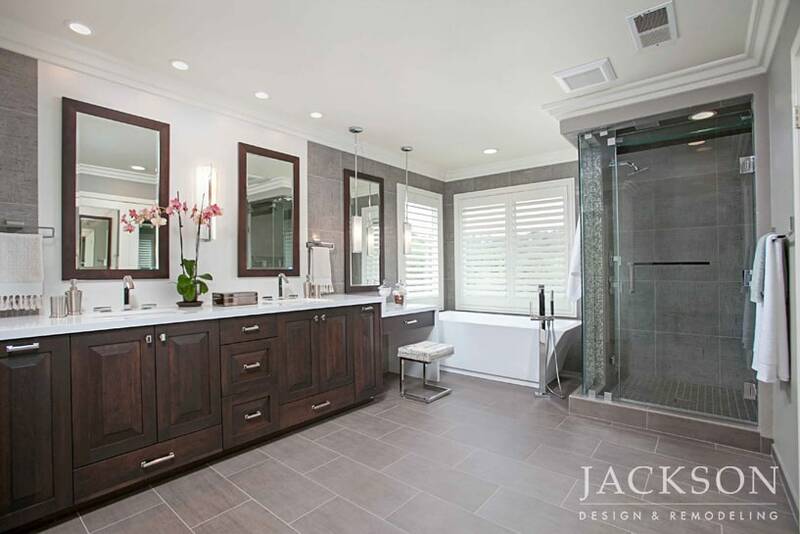 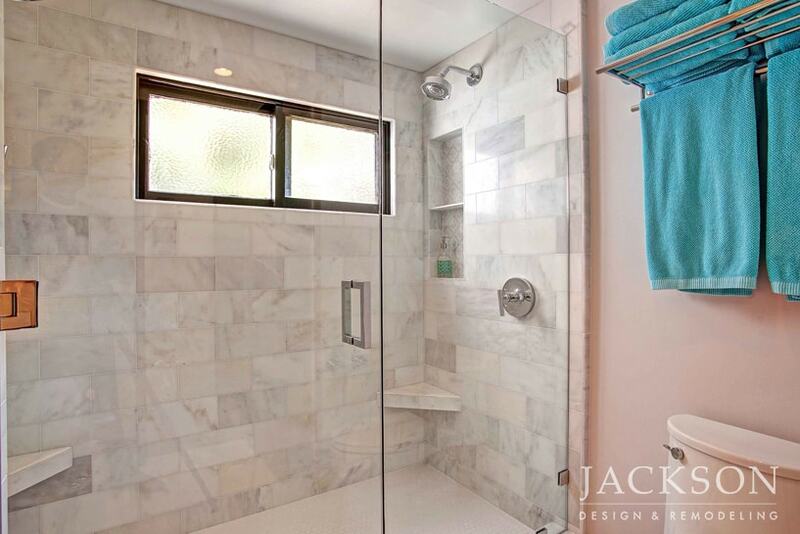 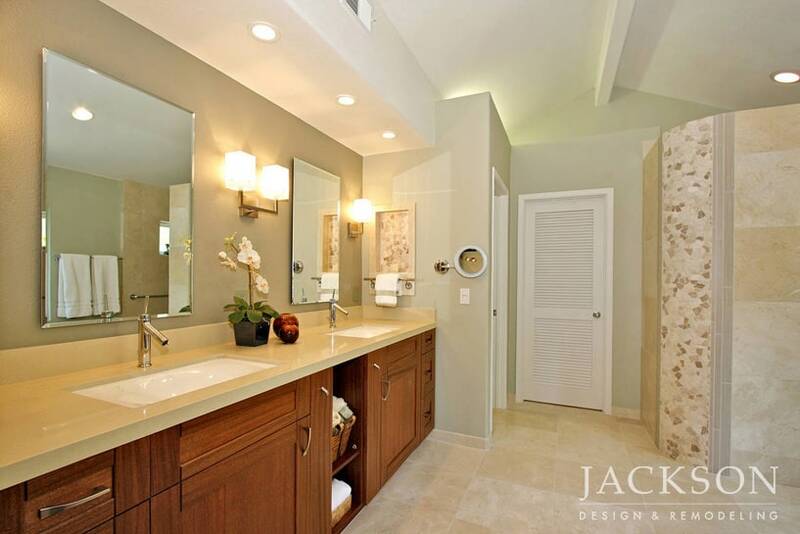 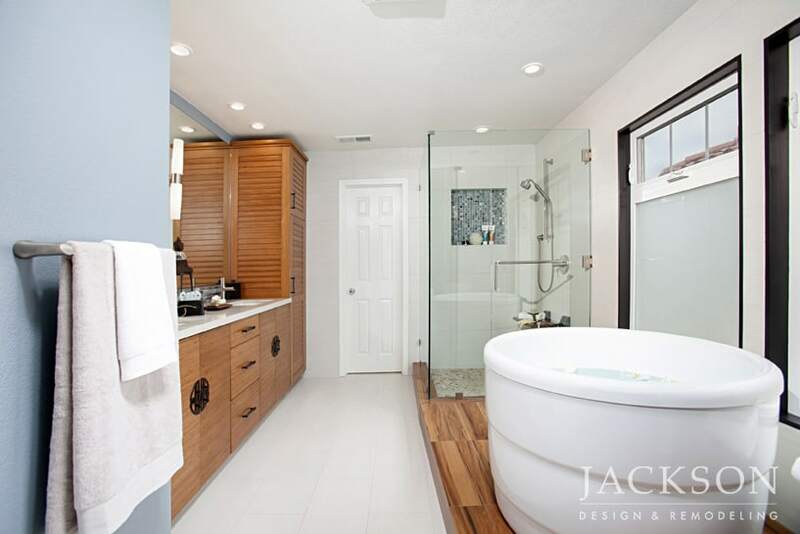 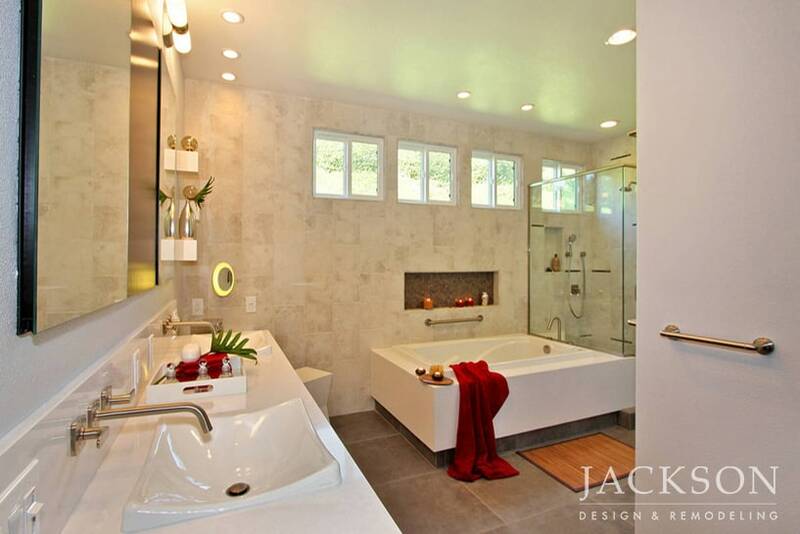 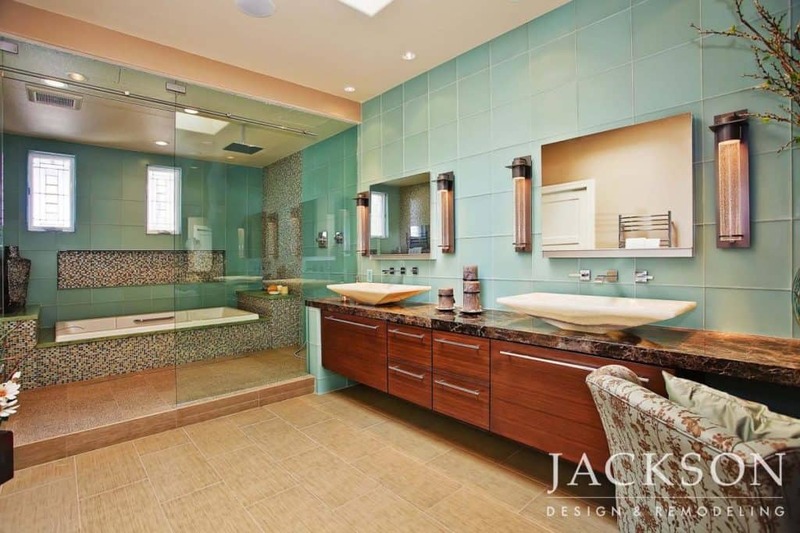 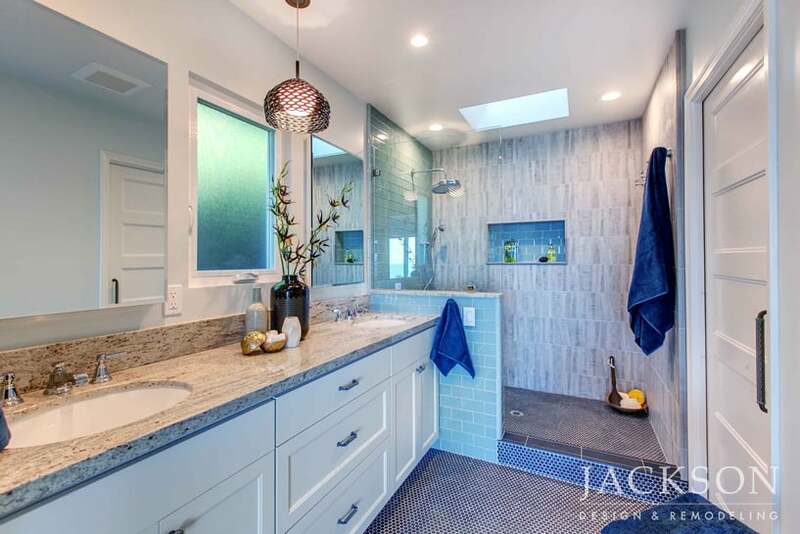 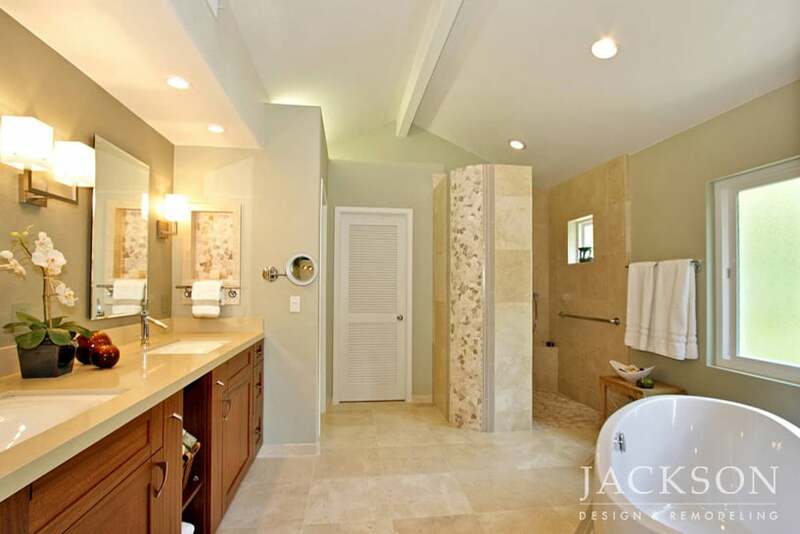 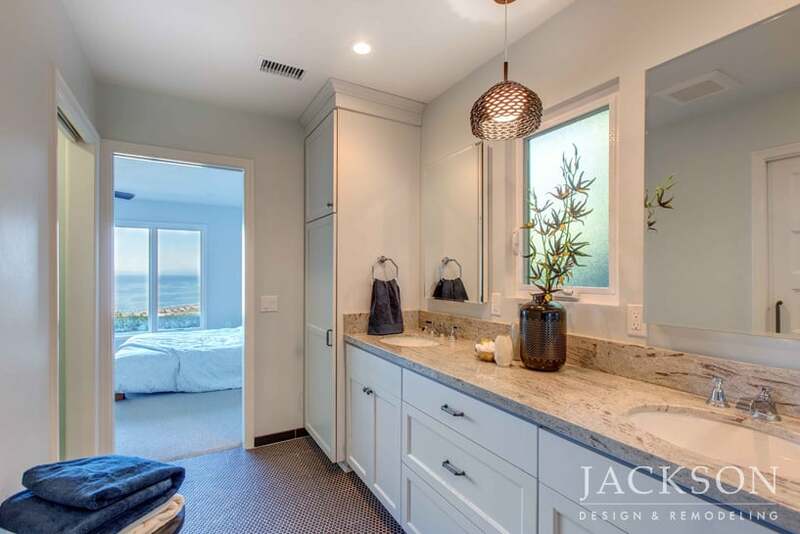 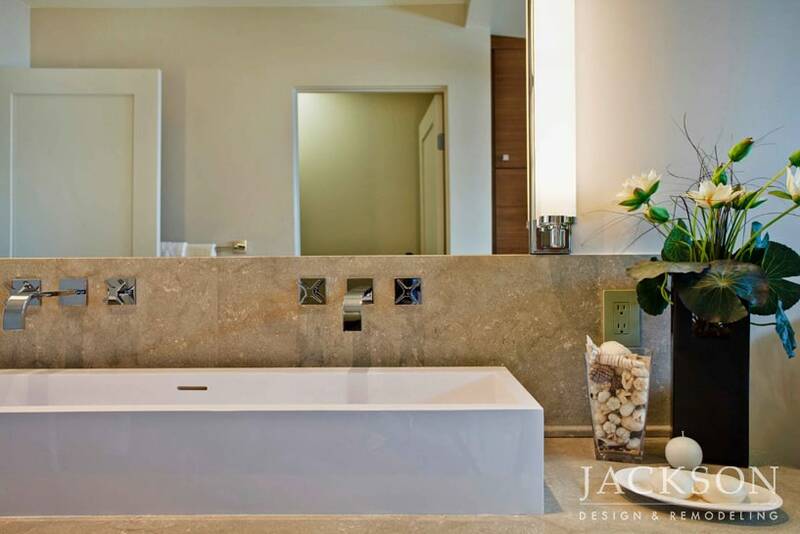 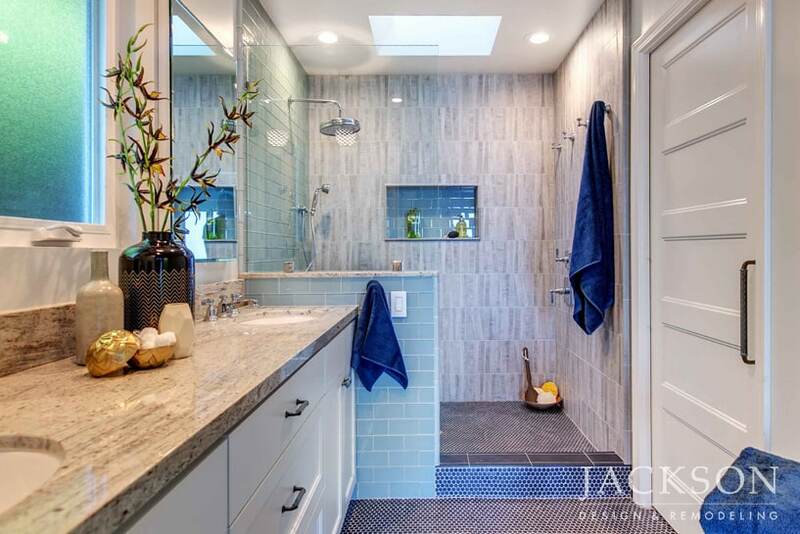 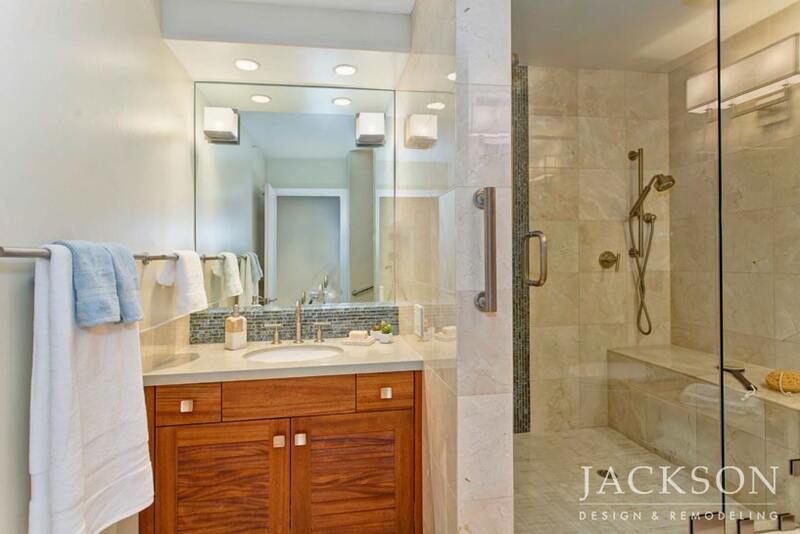 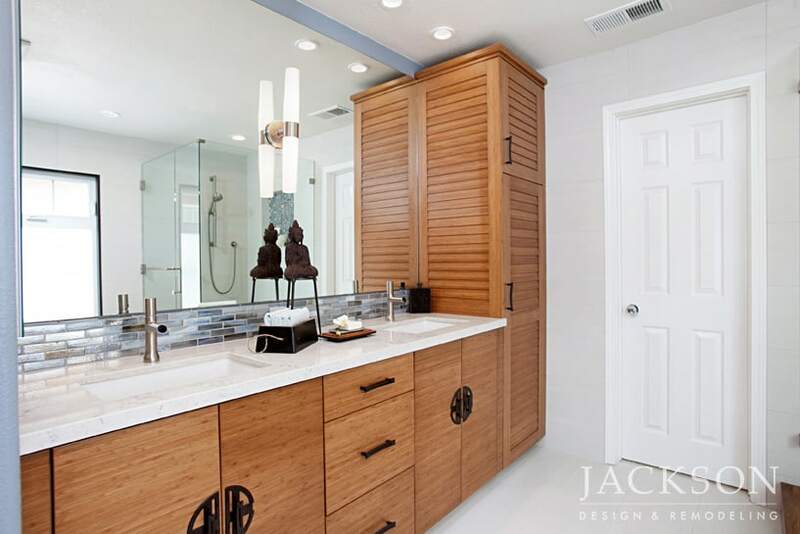 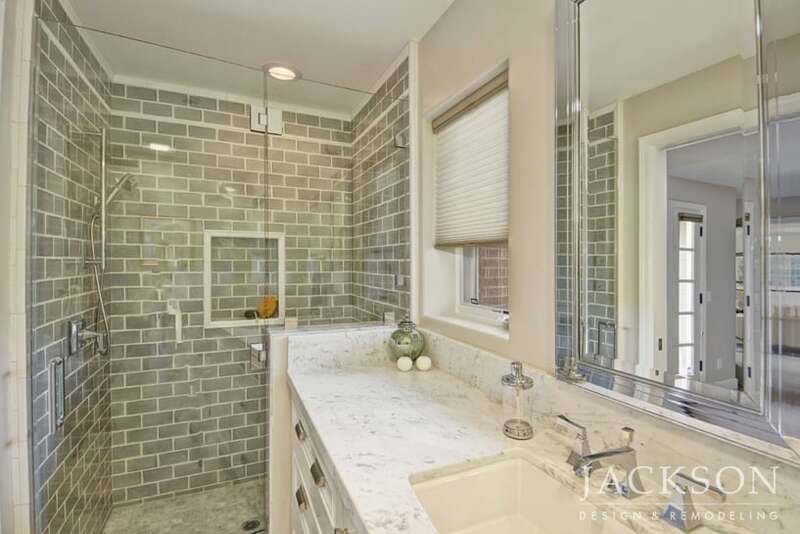 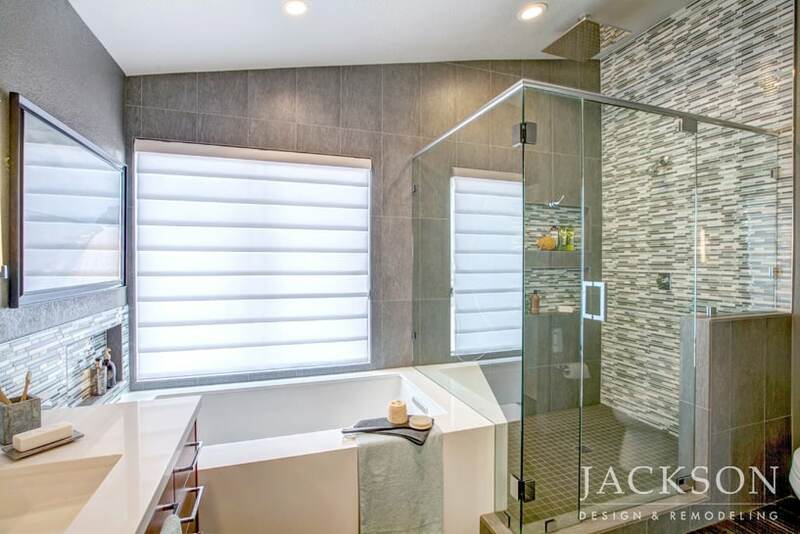 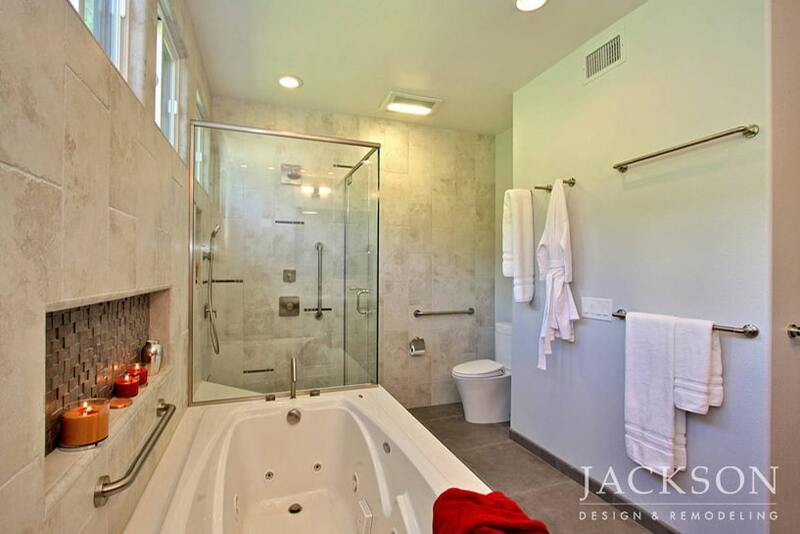 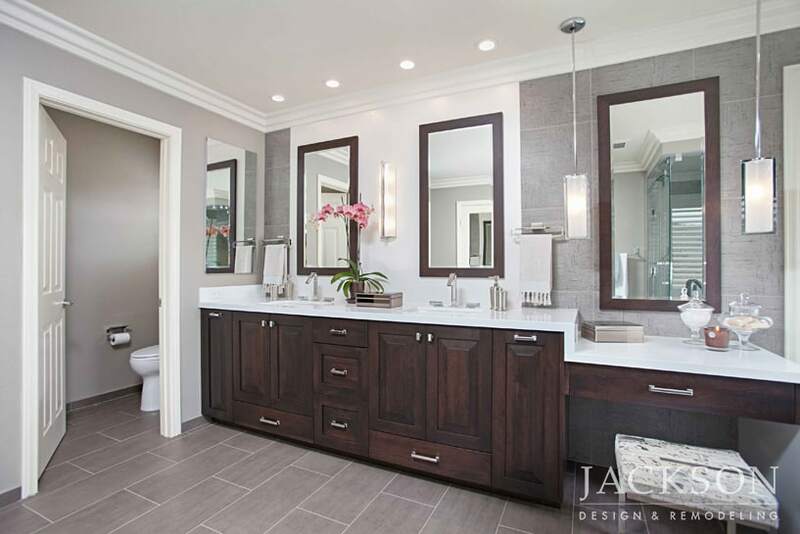 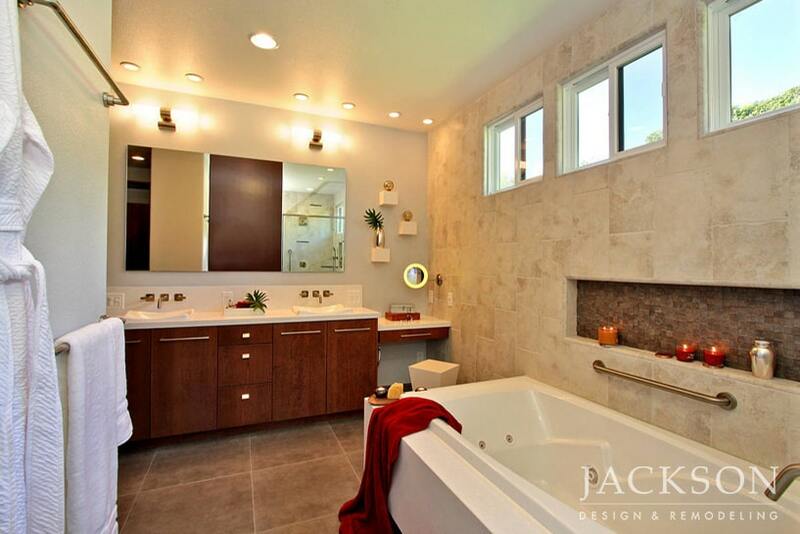 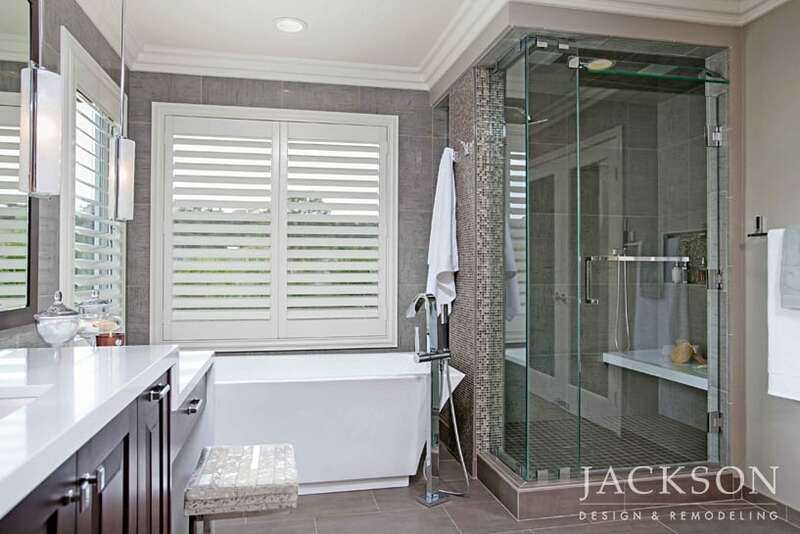 This master bathroom is a luxurious retreat with a palette reflecting the nearby ocean. 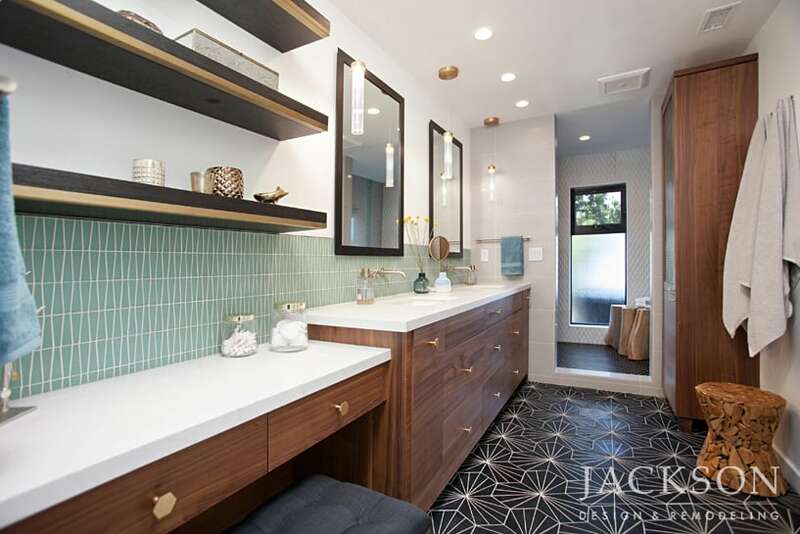 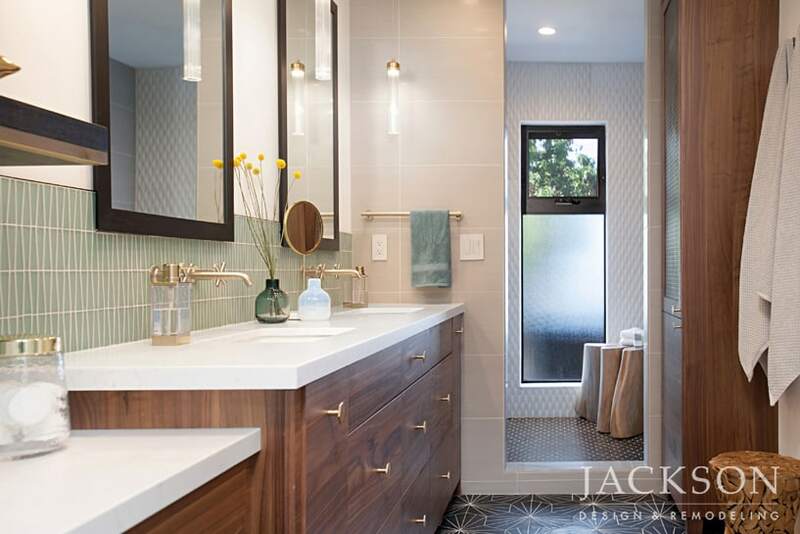 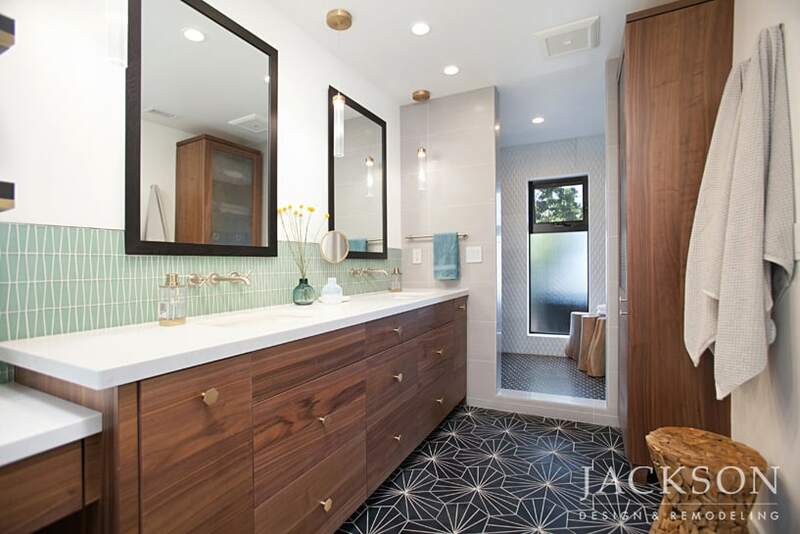 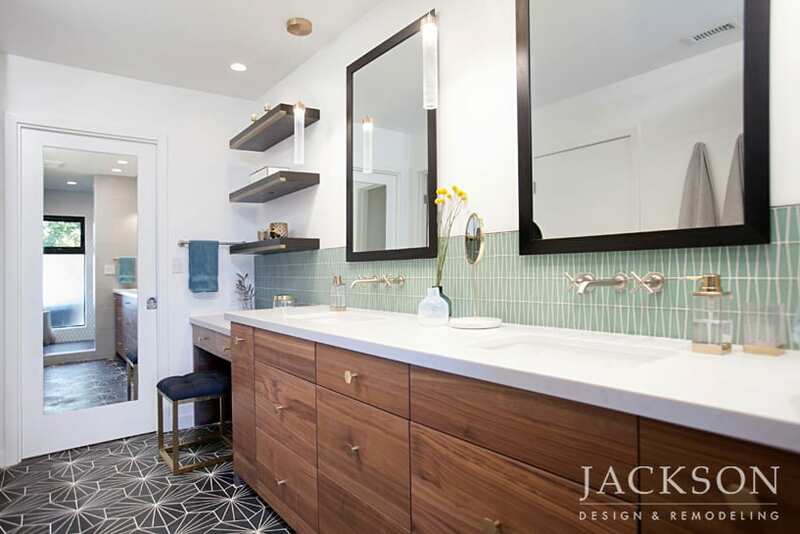 Influenced by Mid-Century Modern design with natural elements, the space features a stunning combination of patterned tile, interesting textures, and gleaming metallics. 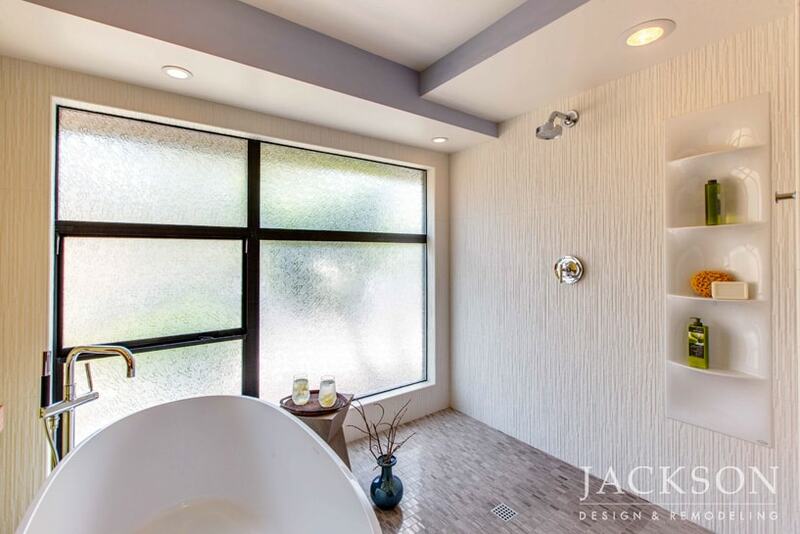 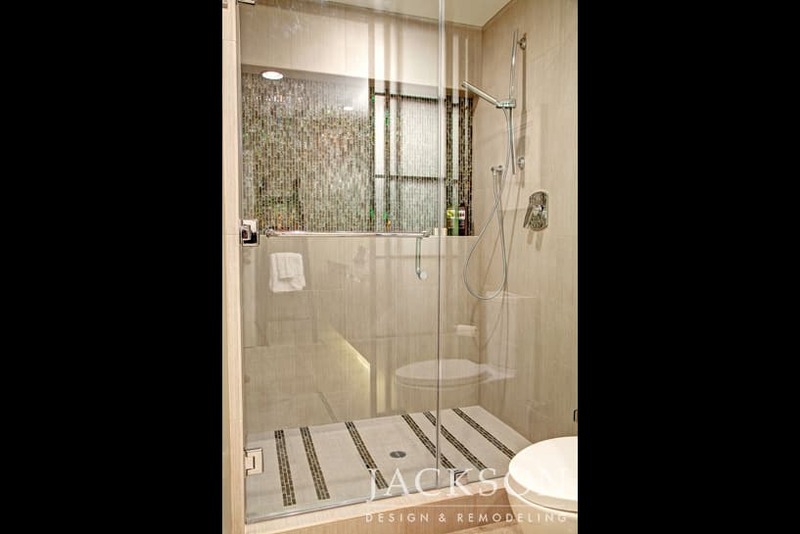 Instead of a tub, the clients chose an exceptionally large, spa-like shower with a window designed to align perfectly with the shower opening. 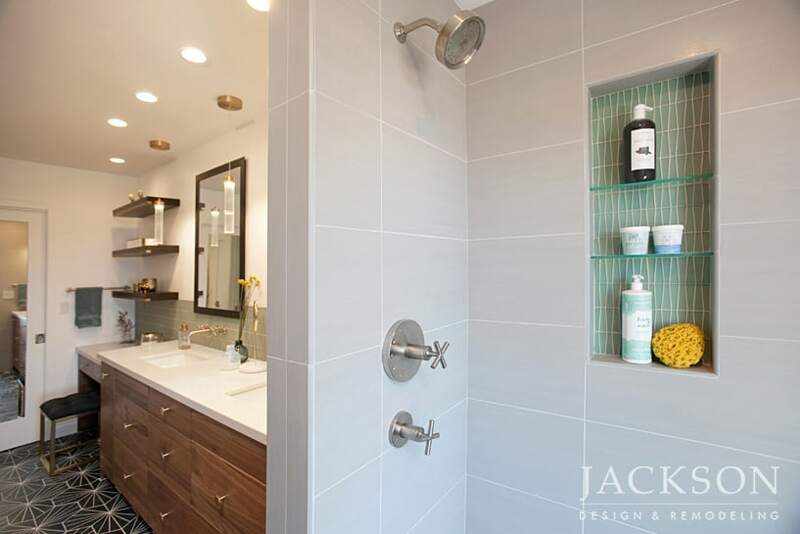 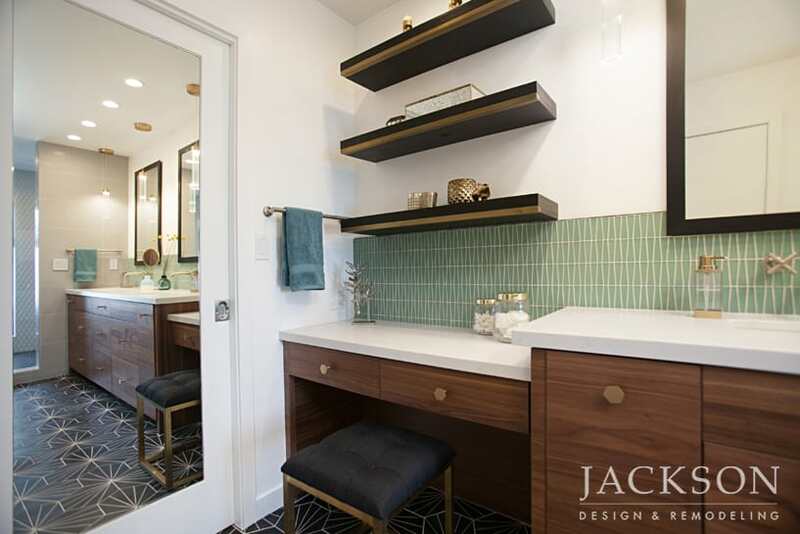 A couple with an outdated bathroom desired a contemporary space with significantly more storage and a sophisticated design. 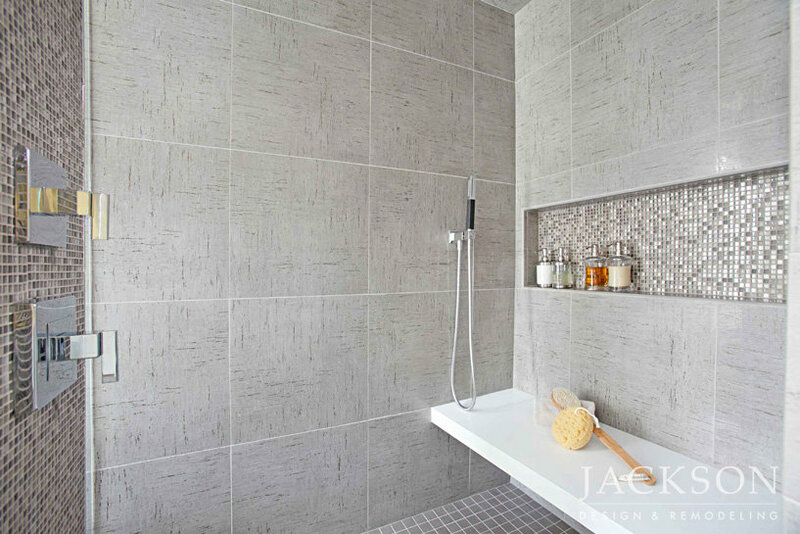 Several shades of gray with contrasting textures create a subtle, refined color palette. 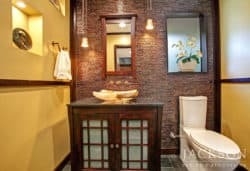 The vanity area is a treasured detail for the wife, who enjoys getting ready in her new luxury spa, surrounded by beautiful details. 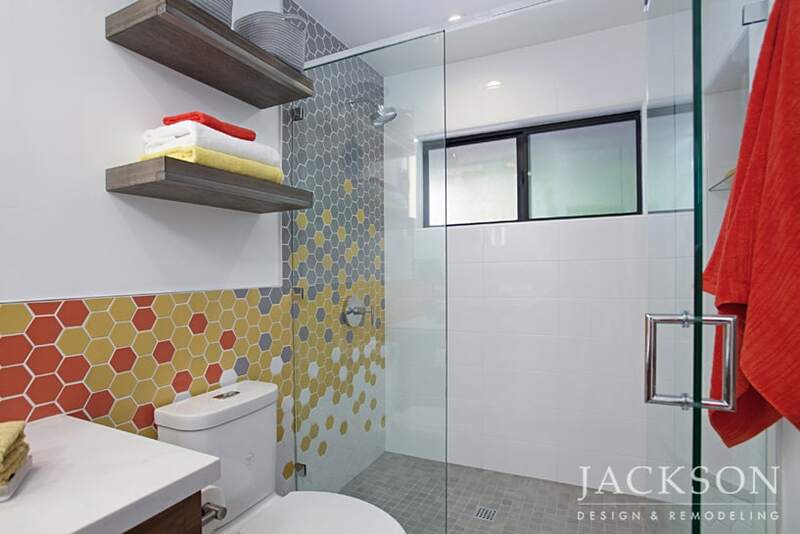 With elements reminiscent of the geometric shapes the artist Mondrian is known for, this master bathroom delights the eye. 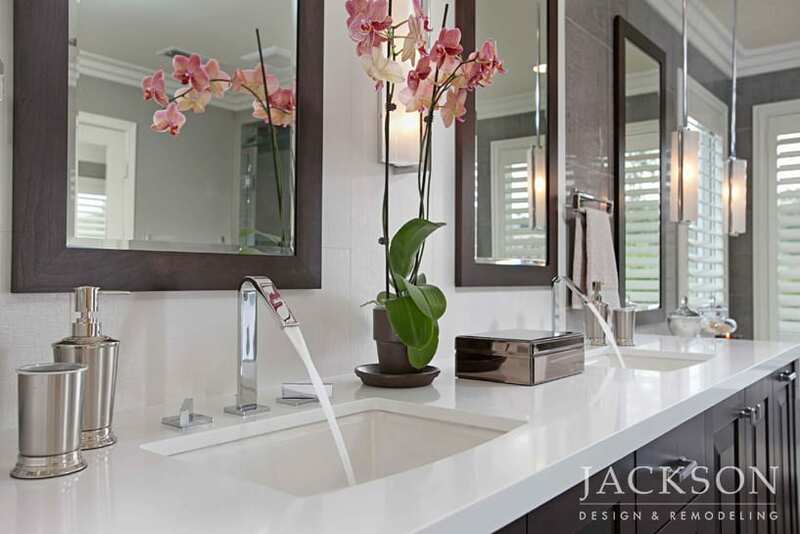 Clean lines, layers of lighting, and white surfaces refresh the spirit. 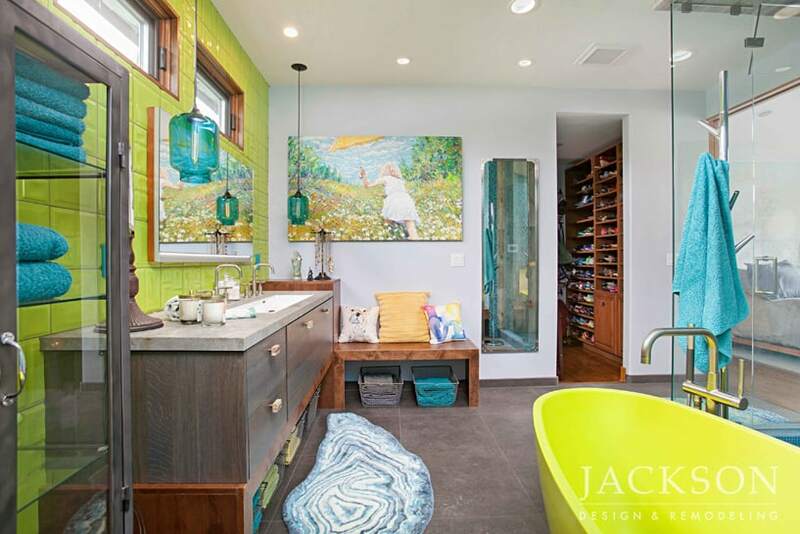 Inspired by the home’s location near the beach and by a favorite painting, this vibrant space for a young professional woman imaginatively expands on the traditional feeling of a bathroom and invites a relaxed appreciation of endlessly intriguing surroundings. 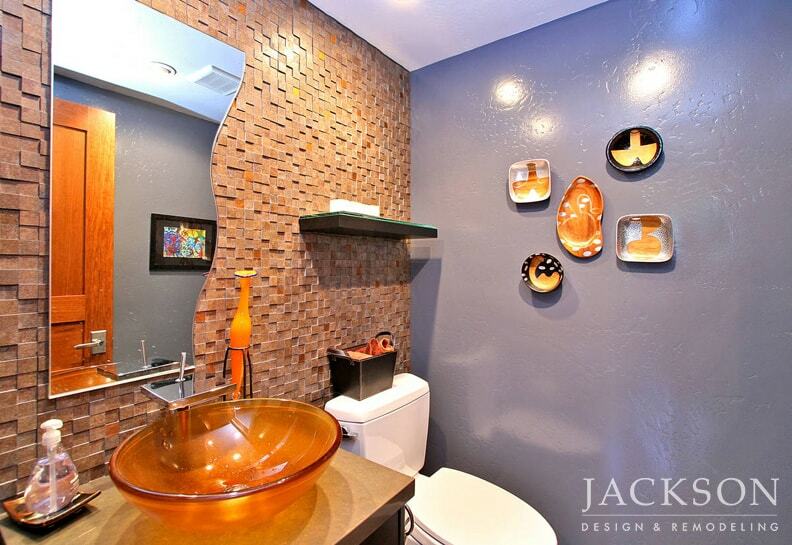 The balanced facets of this dazzling design create an appealing sense of yin and yang. 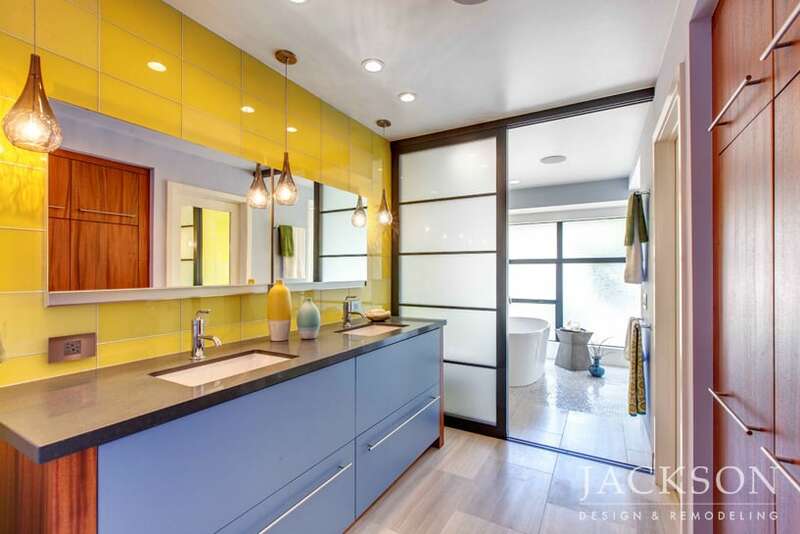 With sunshine yellow, ocean blues, and patterns of waves and sand, this bright bathroom embraces the spirit of the bay and sailboats just outside its windows. The design captures invigorating ideas in a layout that maximizes compact space for shipshape appeal. 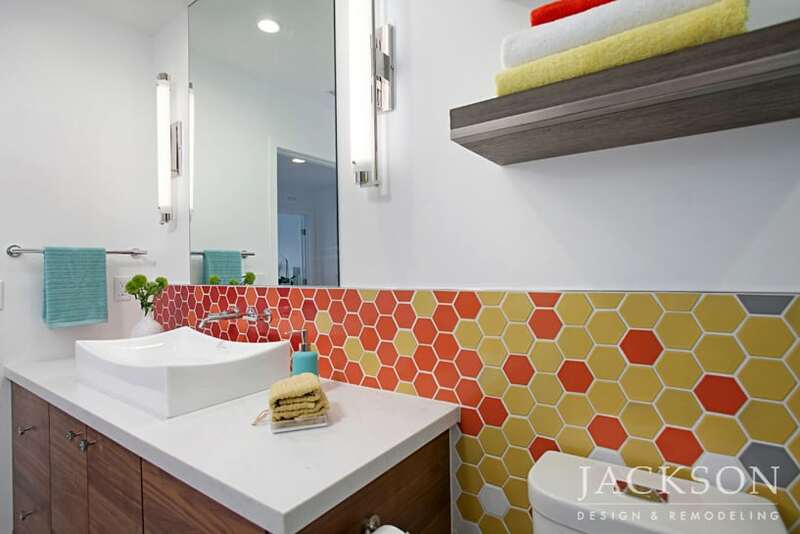 A stunning full wall of hexagon tile in a gradient of powerful colors, from crimson, to sunshine yellow, to gray, now communicates an artistic point of view. 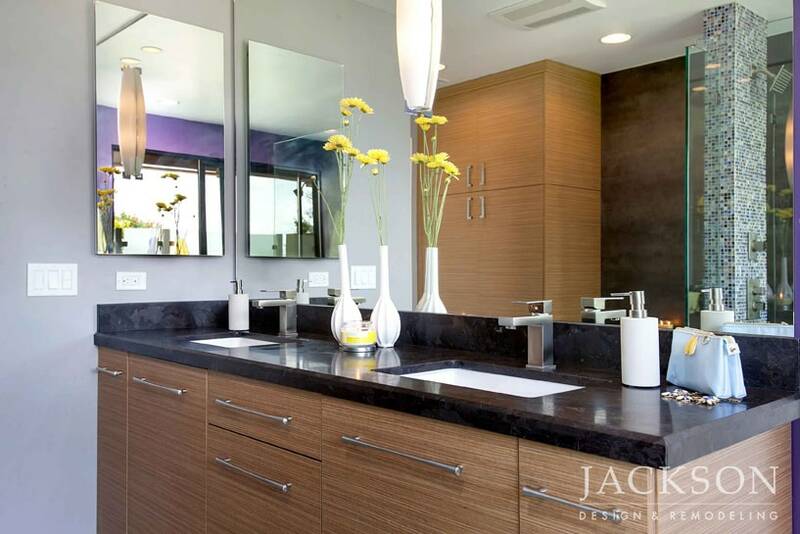 Floating natural wood shelves are an appealing counterpoint to the gleam of surrounding surfaces and a nod to the home’s proximity to the beach. 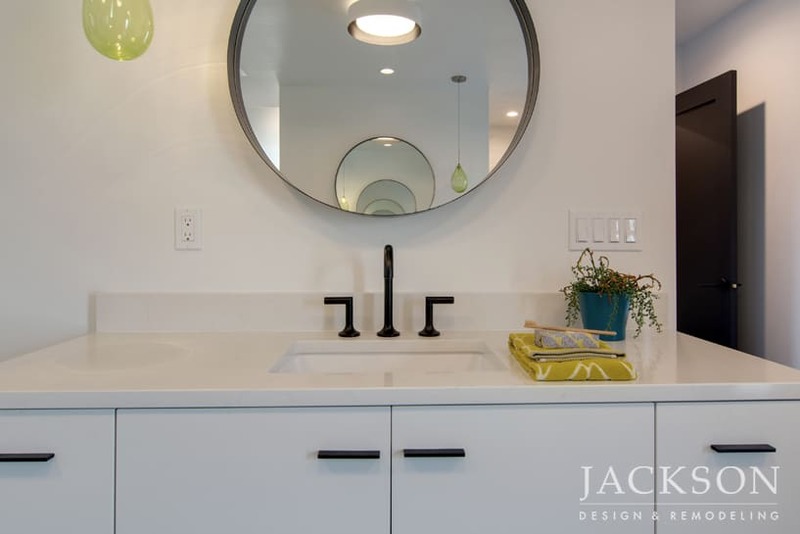 The minimalist profile of the mirror and angled swoop of the sink are stylish details. 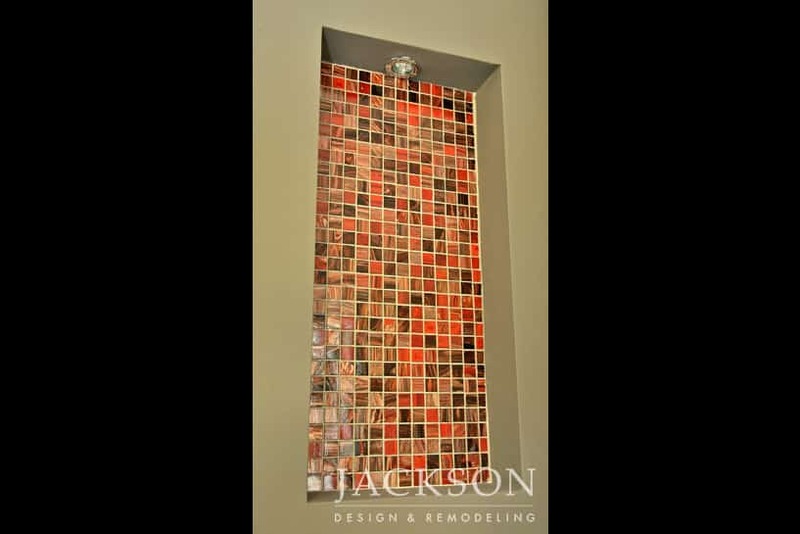 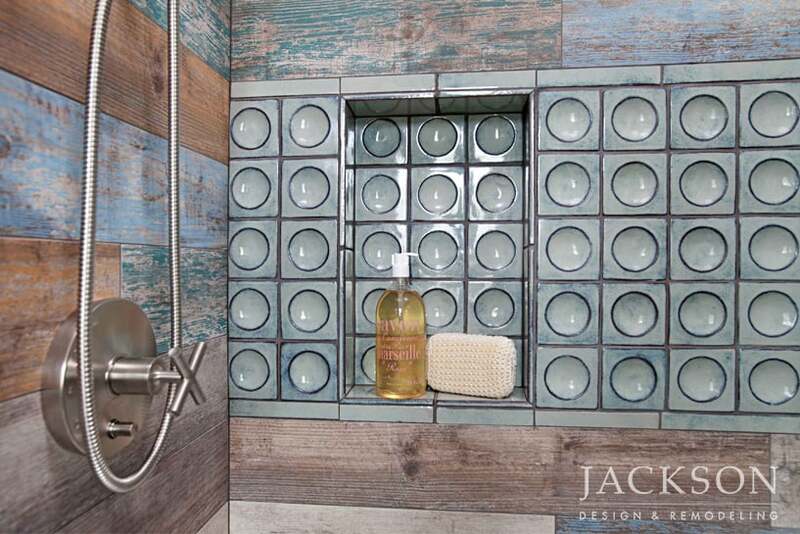 The impressive shower in this guest bathroom was created from hand-painted subway tiles imported from England. 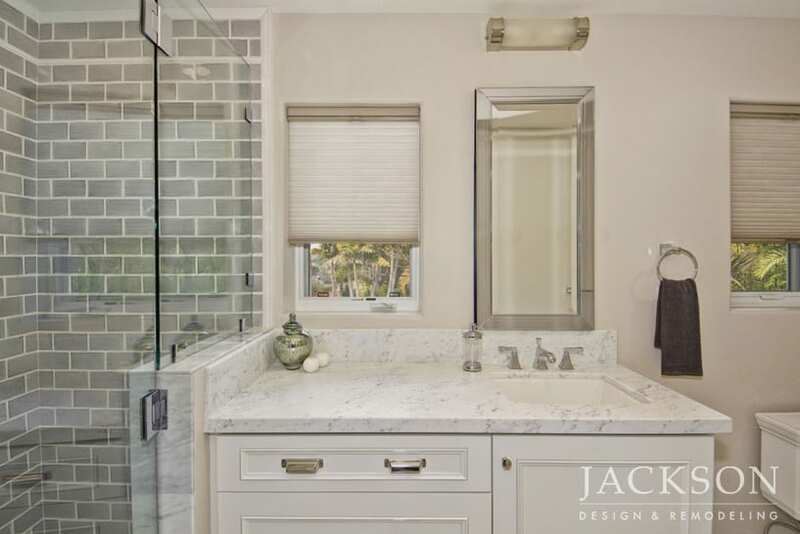 Distinctive white grouting and trim sets a contemporary mood, balanced by the traditional nature of the marble countertop. 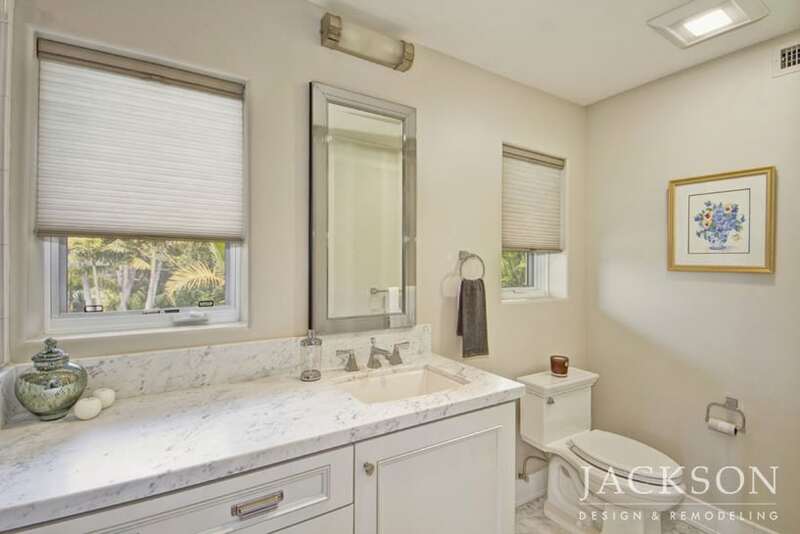 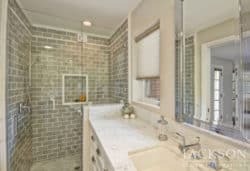 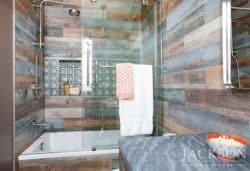 A young professional woman with a love of original design ideas wanted to transform the dull bathroom in her beach home into an interesting and rejuvenating space. 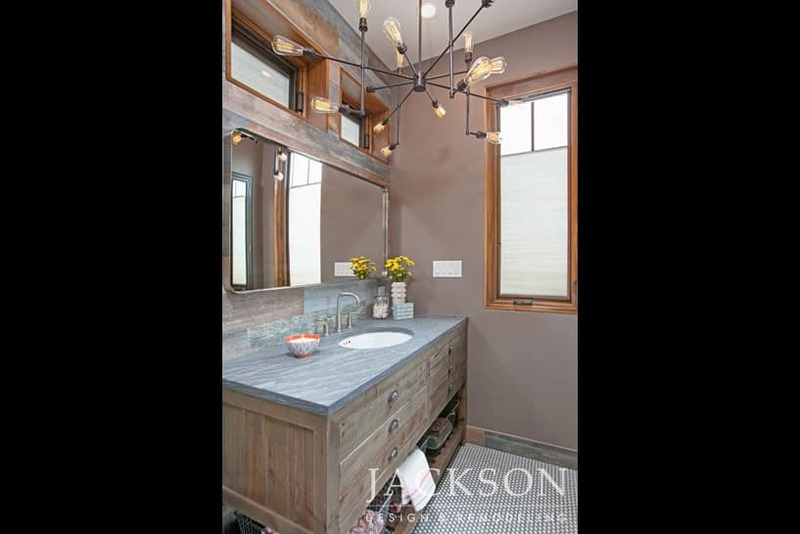 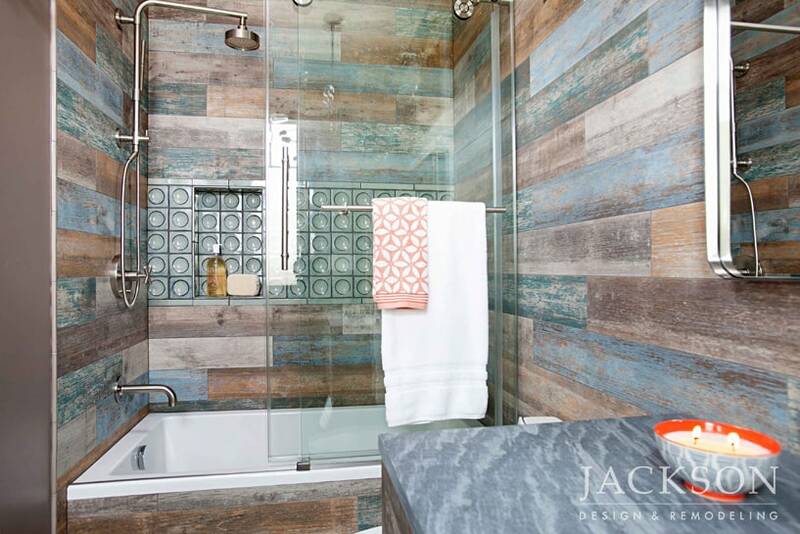 This master bathroom marries a midcentury aesthetic with an imaginative and immersive pattern of porcelain tile reminiscent of a rustic barn. 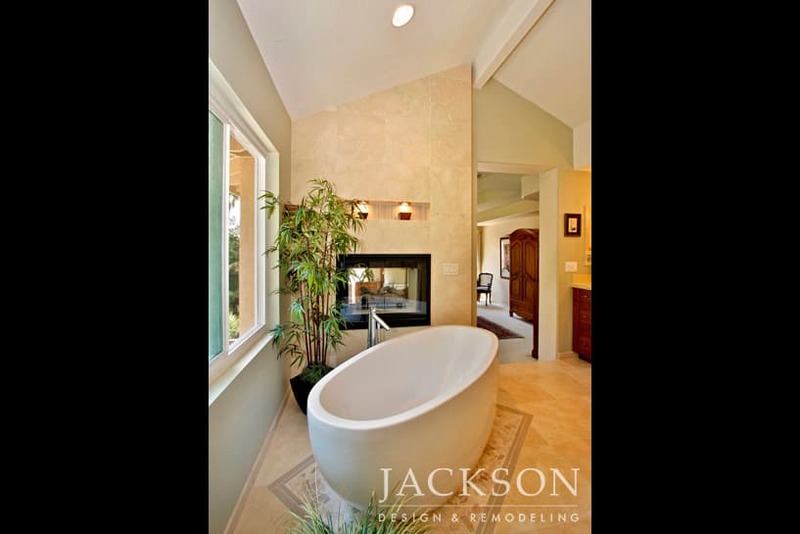 This master bathroom’s deep bathtub filled from above was inspired by the traditional Japanese furo or yubune. 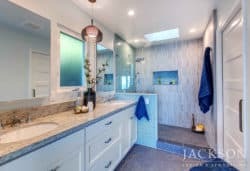 Tranquil colors and natural light create a seductively relaxing atmosphere with a calming connection to the outdoors. 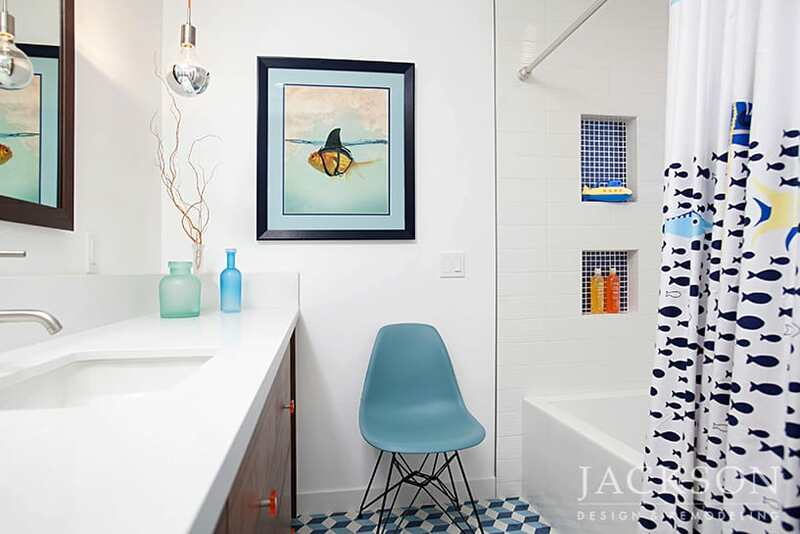 In her lively home by the beach, a young professional woman wanted to dramatically transform a downstairs bathroom. 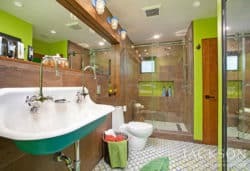 Walls of porcelain tile reminiscent of earthy wood are balanced with vivid green and vintage elements. 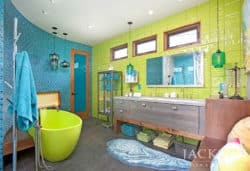 Evoking the spirited freedom of a vintage cabin on a tropical island, this refreshingly unconventional space offers a colorful respite from the everyday. 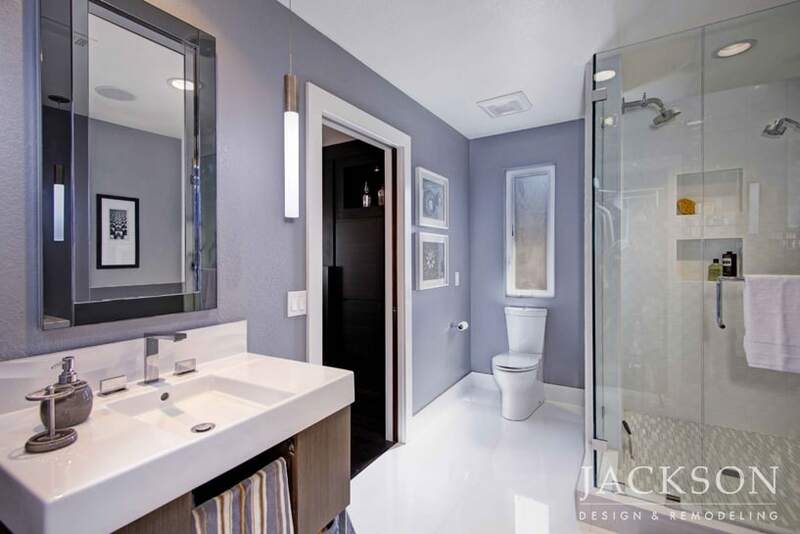 This master bathroom for a single professional upgrading his master suite is a serene study in blue gray, black and white. 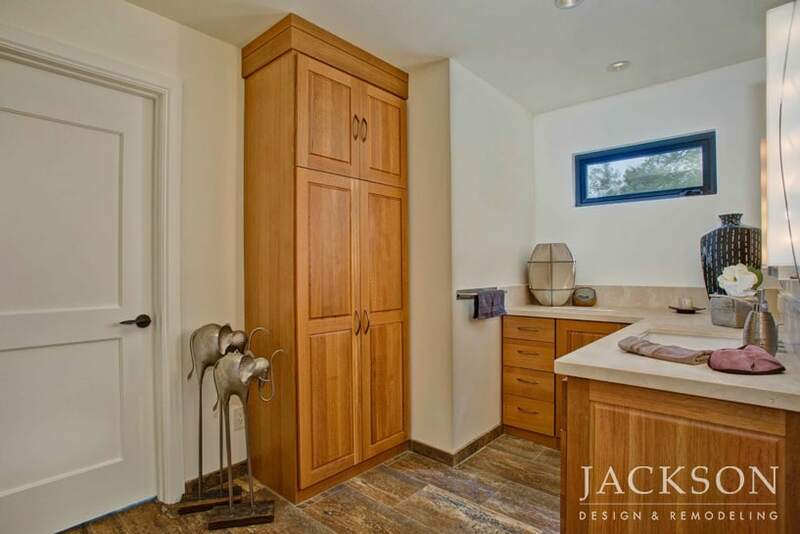 The floor plan was rearranged to better use the space and to add a walk-in closet. 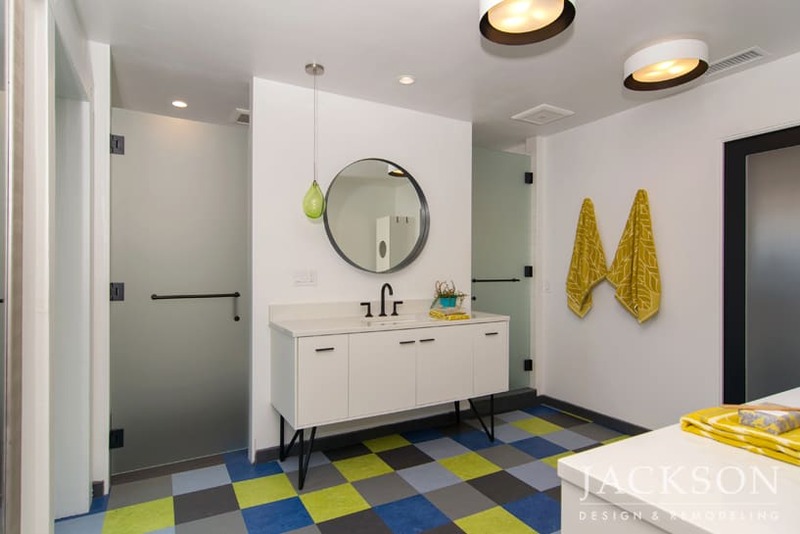 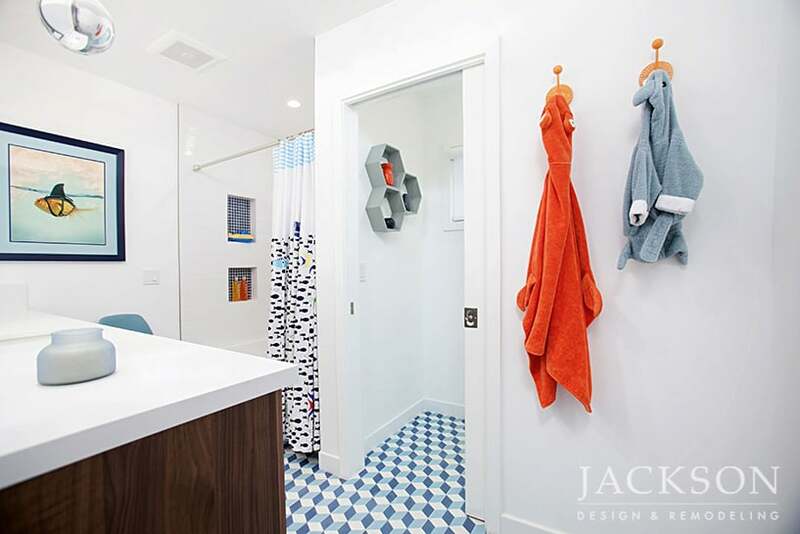 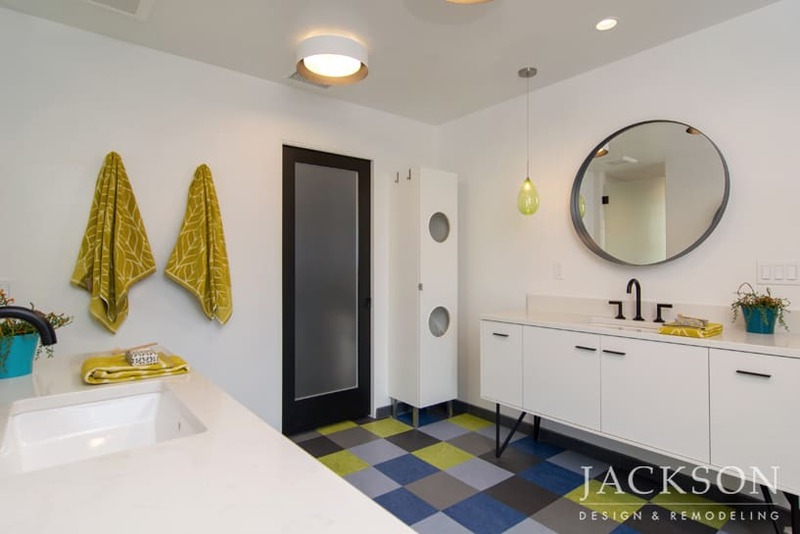 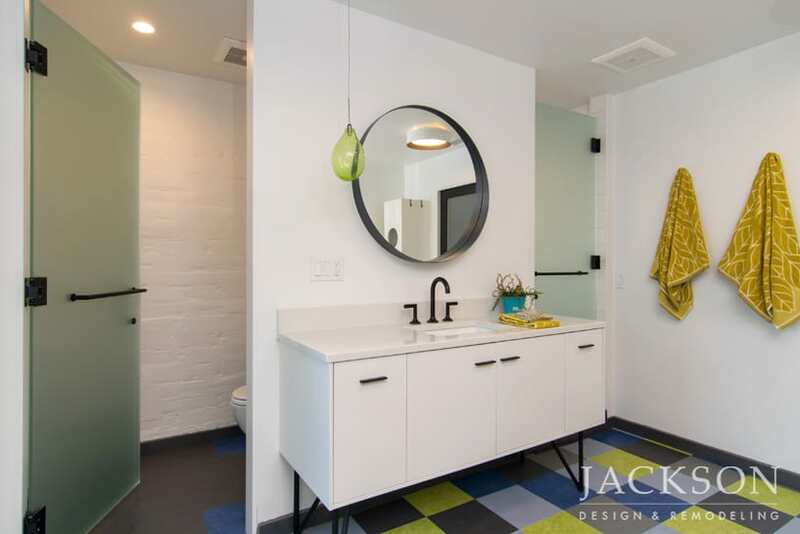 Designed as a bathroom for the clients’ kids, this space communicates youthful energy with bright white, colorful tile, and playful geometric shapes. 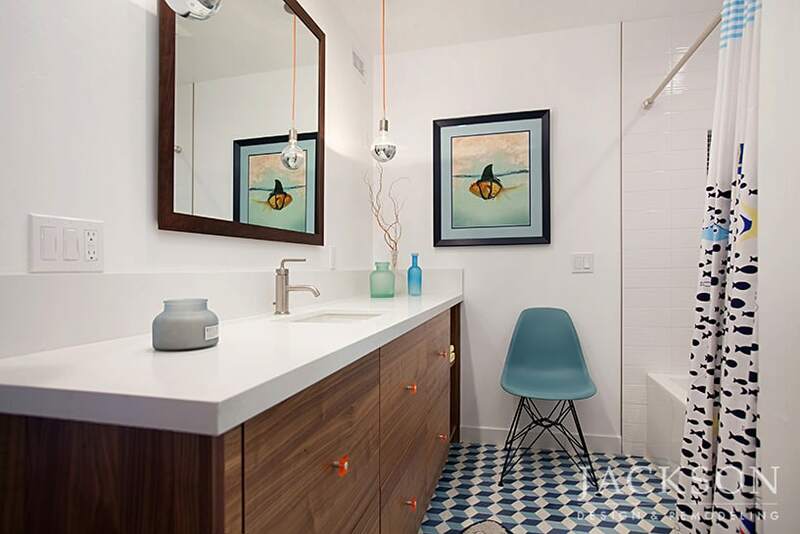 While blue is the predominant color, emphasizing a connection to the nearby ocean, the orange accents of the lighting cords and cabinet pulls inject additional vibrancy into the space. 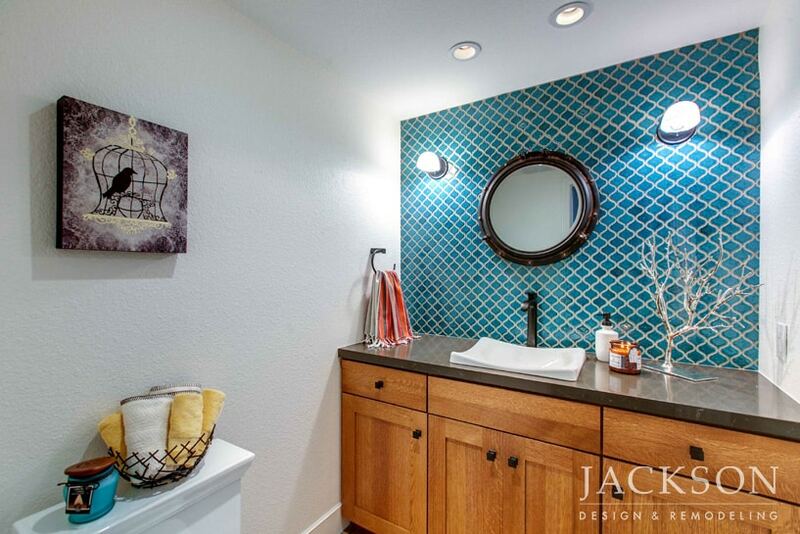 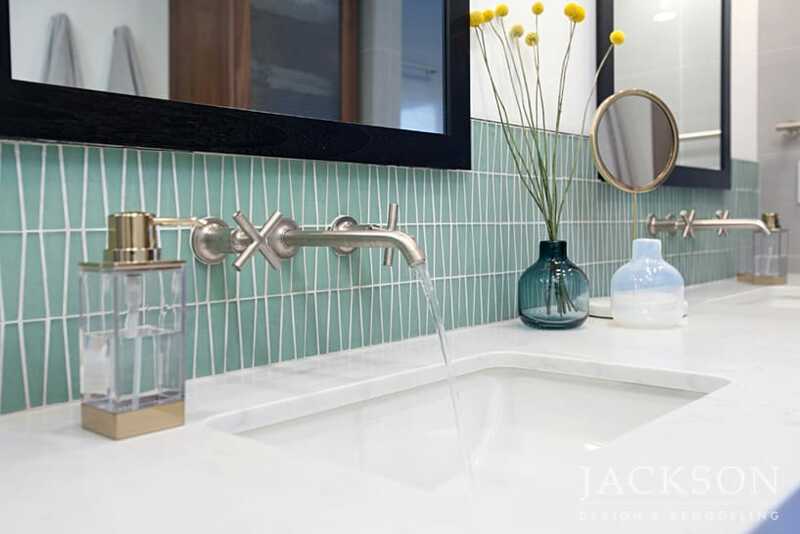 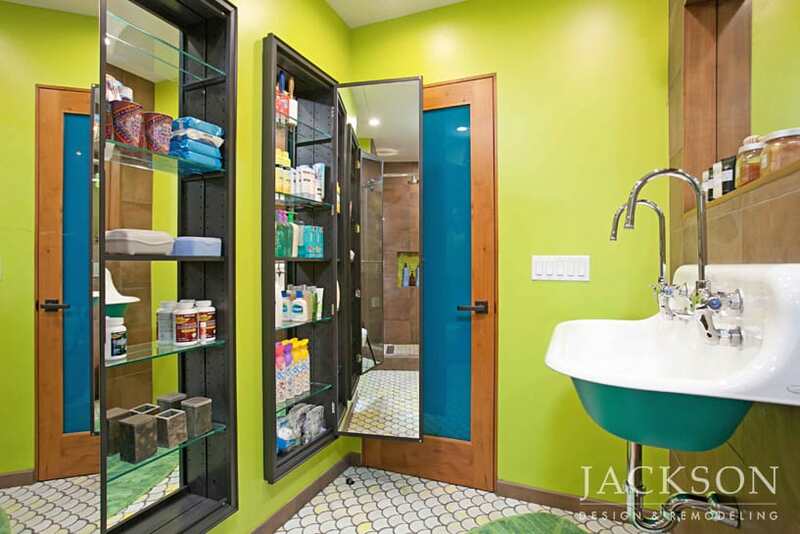 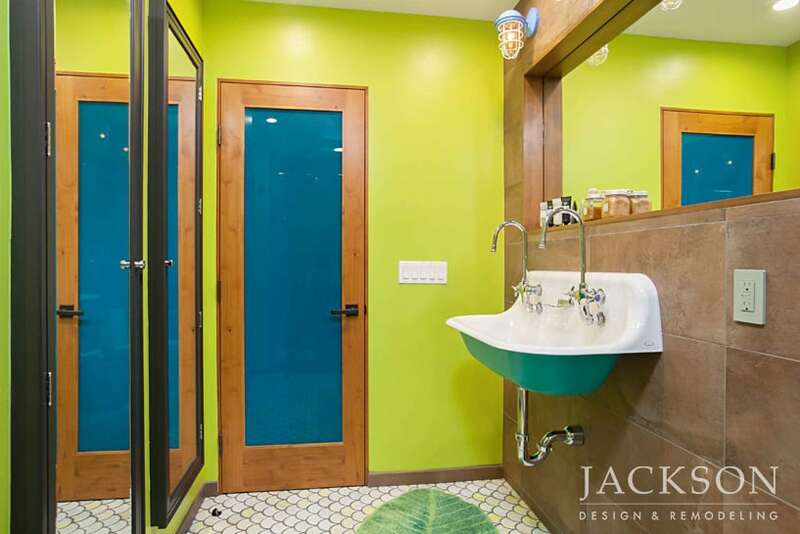 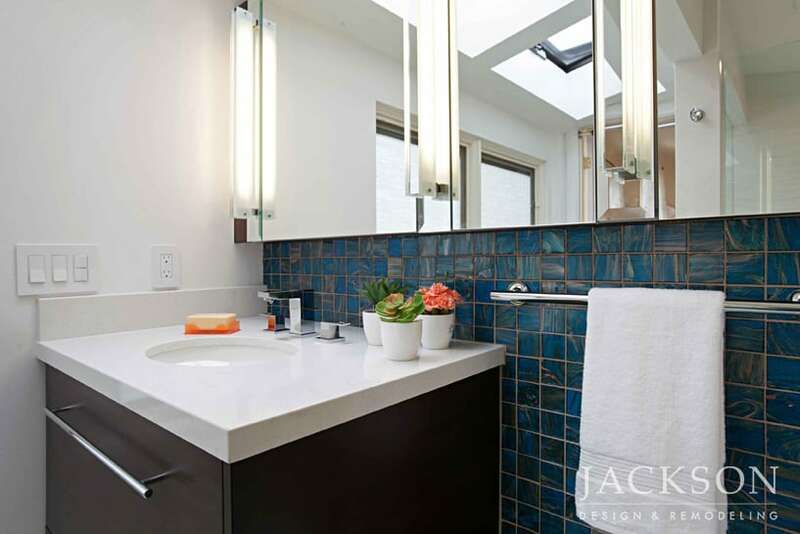 Intense colors inspired by living near the ocean give this small powder room powerful style. 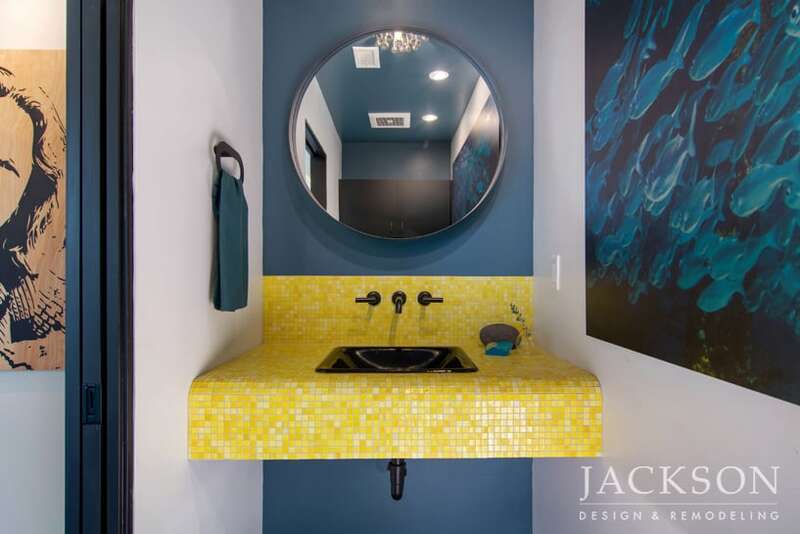 The floating sink in vivid yellow is a memorable detail designed to make the limited space feel more open. 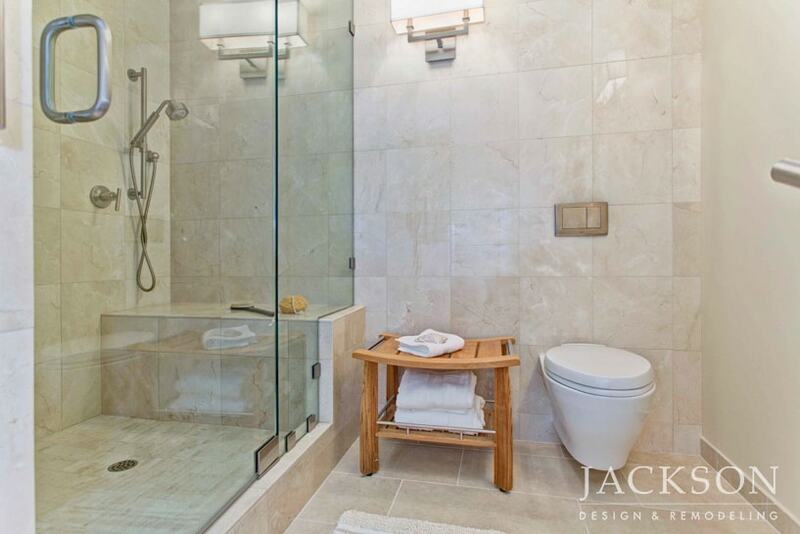 For a couple sharing a master bathroom, a sense of separate space was essential. 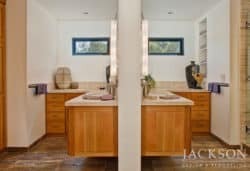 Distinct areas for the husband and wife mirror each other with pleasing symmetry and a modern organic aesthetic for award-winning results. 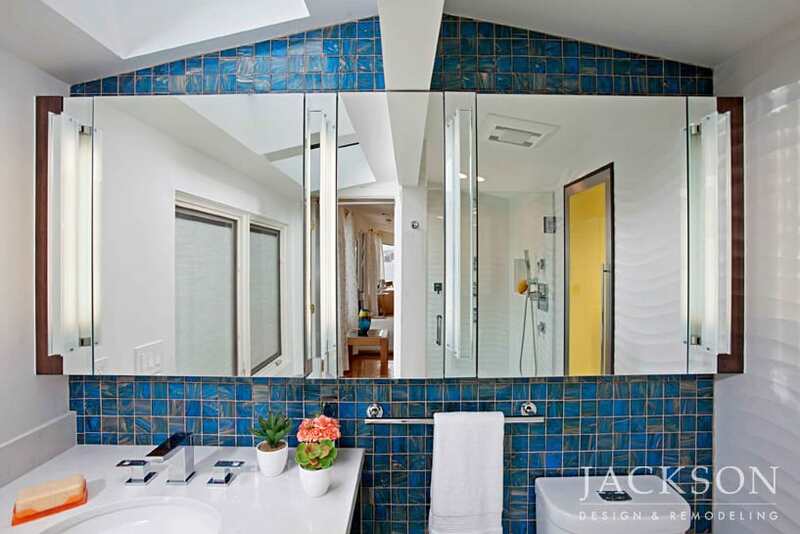 In an eclectic mountaintop home, this memorable master bath was designed to evoke the experience of a Caribbean destination resort with a contemporary aesthetic. 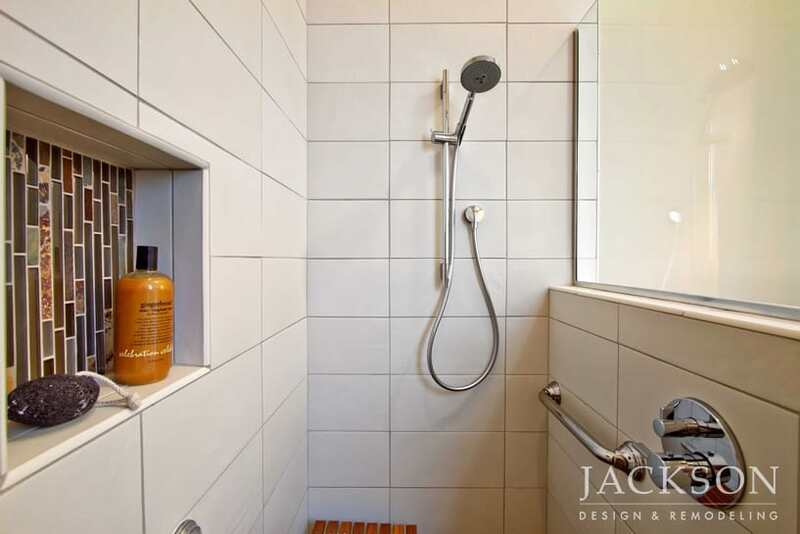 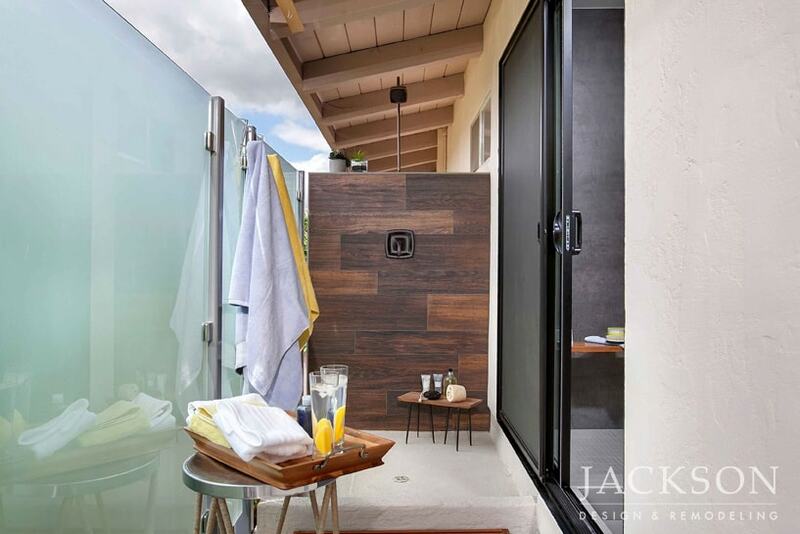 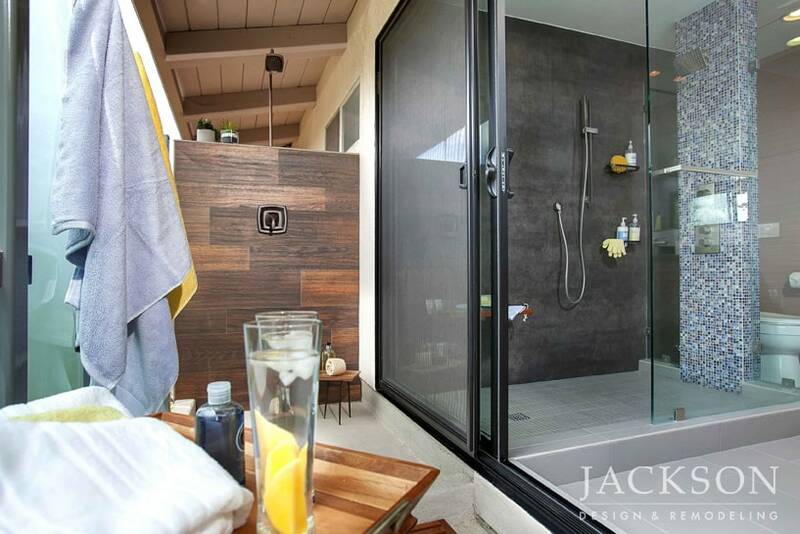 Connected indoor and outdoor showers, distinctive materials, and the design’s emphasis on openness appeal to the imagination. 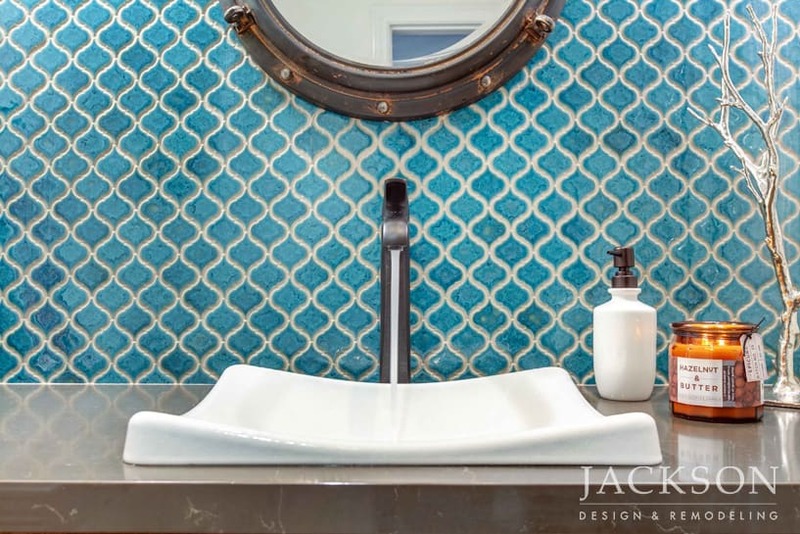 Inspired by the client’s appreciation for sparkling gemstones and the colors of the nearby ocean, this master bathroom soothes the spirit with layers of tranquil hues and textured tile. 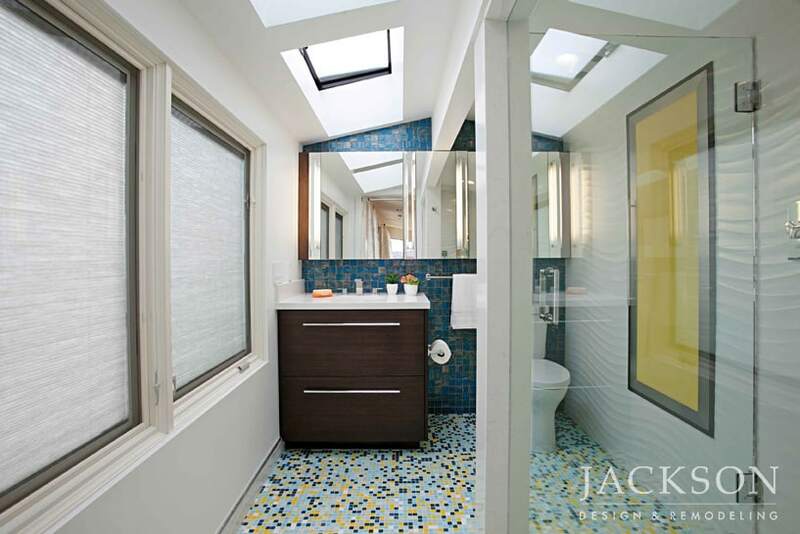 A focus on natural light lends a fresh, open feeling to the space. 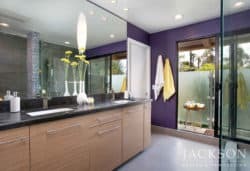 This tranquil, award-winning master bathroom awakens the spirit, soothes the senses and brings the ancient ritual of Japanese soaking to the modern environment of a young professional couple remodeling their whole home. 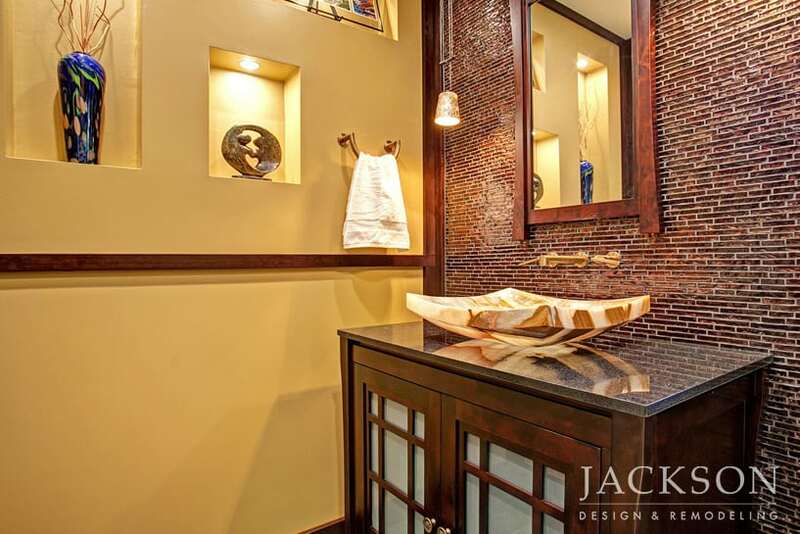 This multiple award-winning Asian-inspired powder room conveys a glittering sense of drama in a small space. 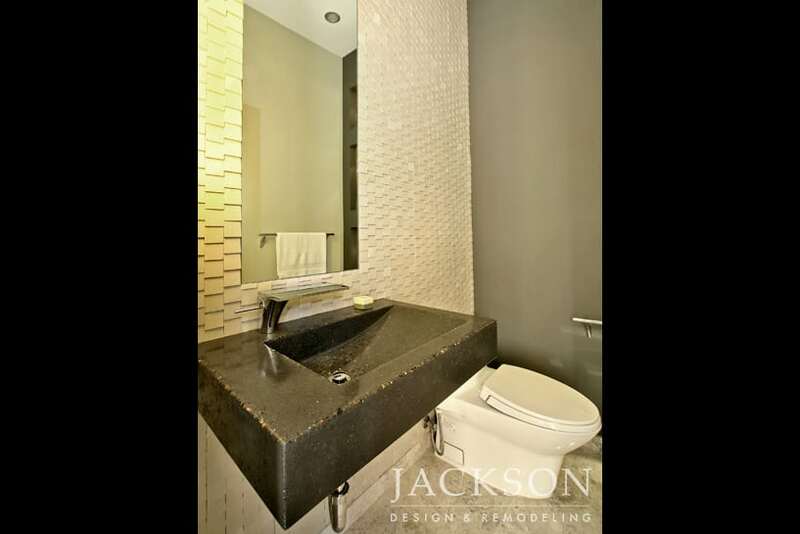 Tile gleams in deep hues of ebony, gold and dark brown, illuminated by gold leaf lighting, activated by sensor upon entry. 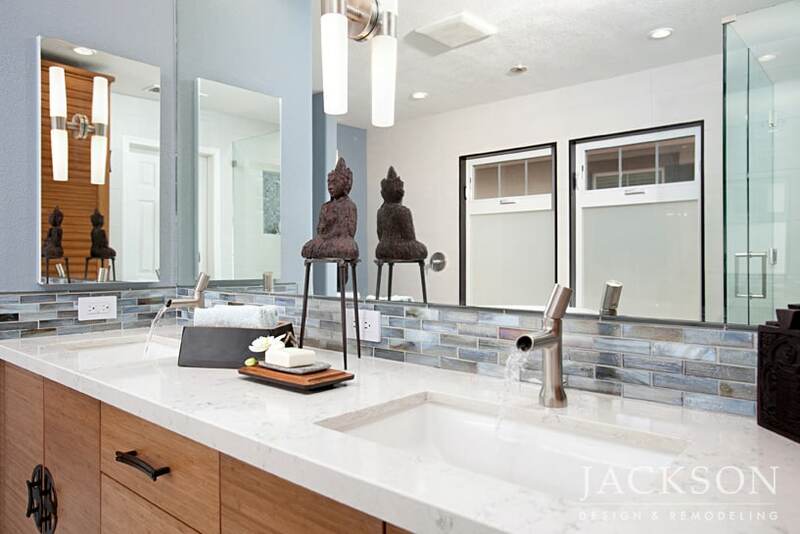 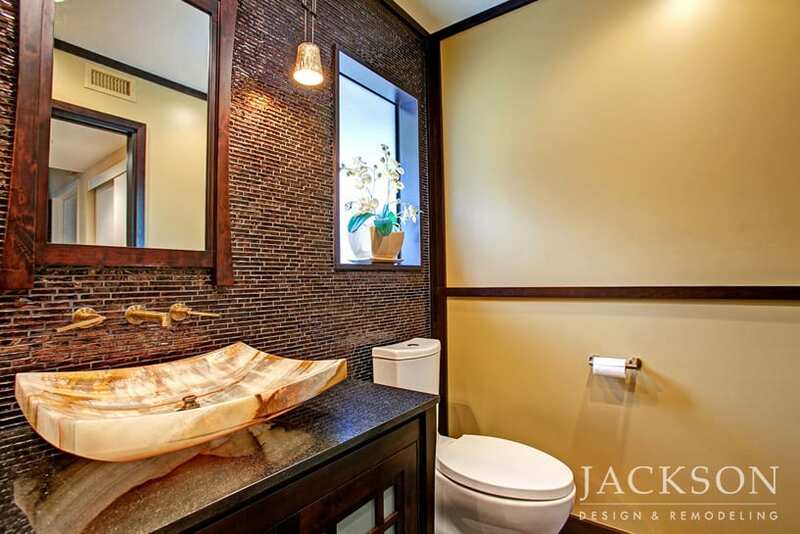 Simple luxury was created in this award-winning guest bathroom by harmonizing tranquil colors, the visuals of flowing waterfalls, and the serenity of Asian-inspired lines. 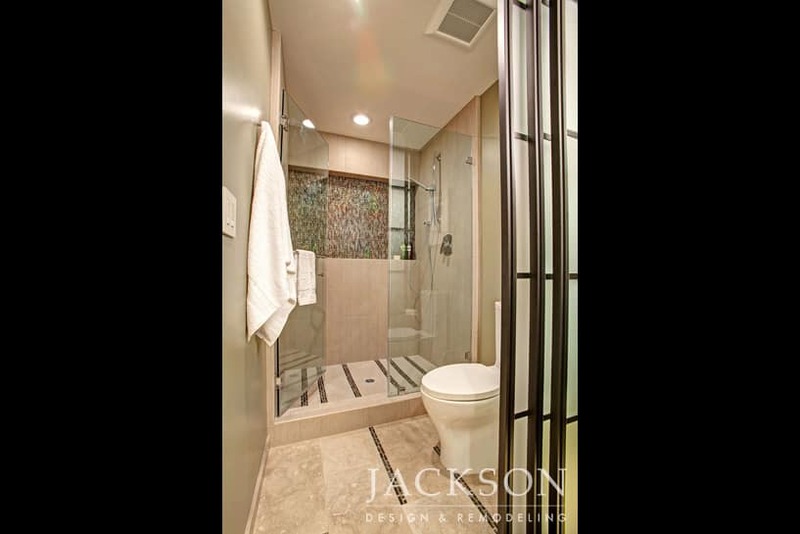 A Shoji screen-style door opens in three widths for varying degrees of privacy. 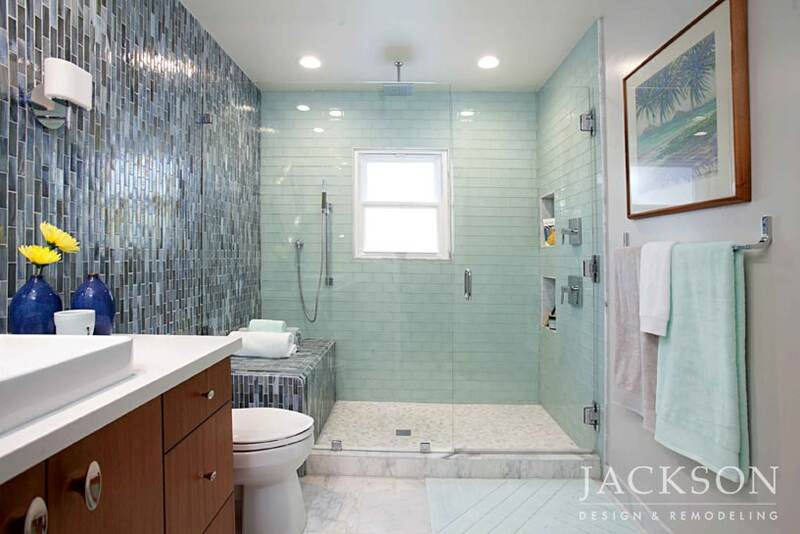 A medley of blue, aqua and pearl against a backdrop of tranquil gray, this Mid-Century Modern inspired master bathroom is defined by a luxurious hexagon marble floor. 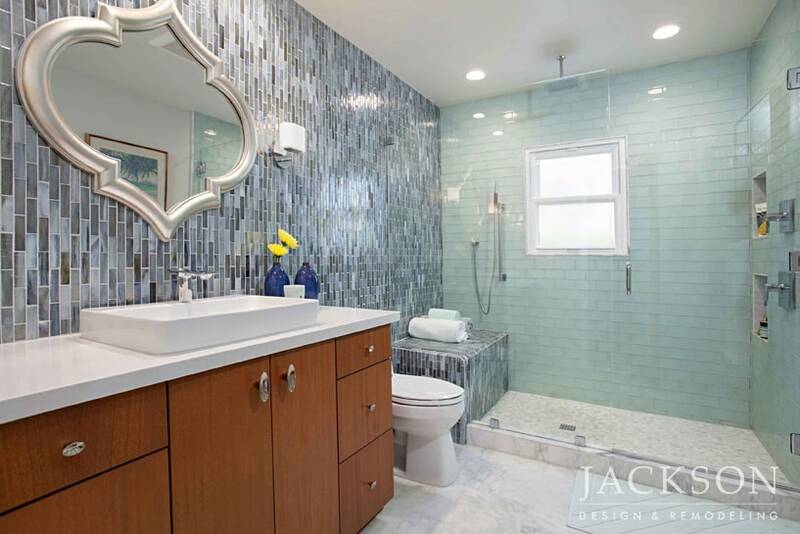 A continuous wall of shimmering glass tile visually elongates the room. 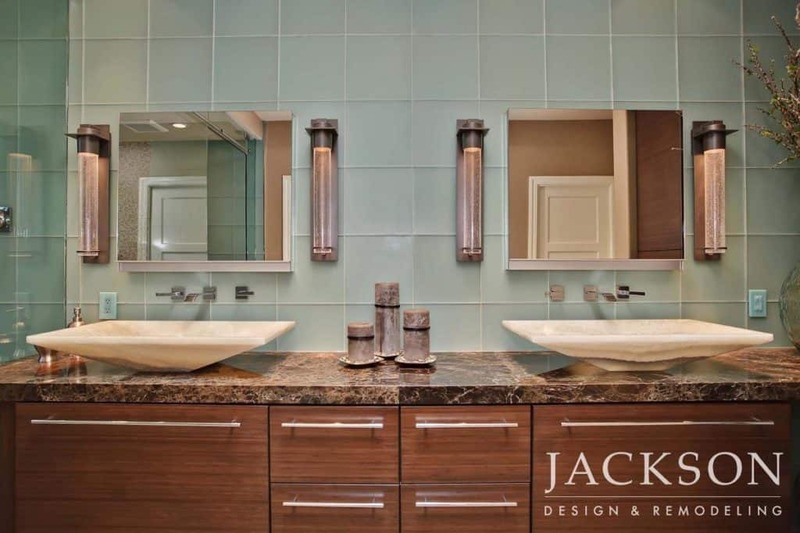 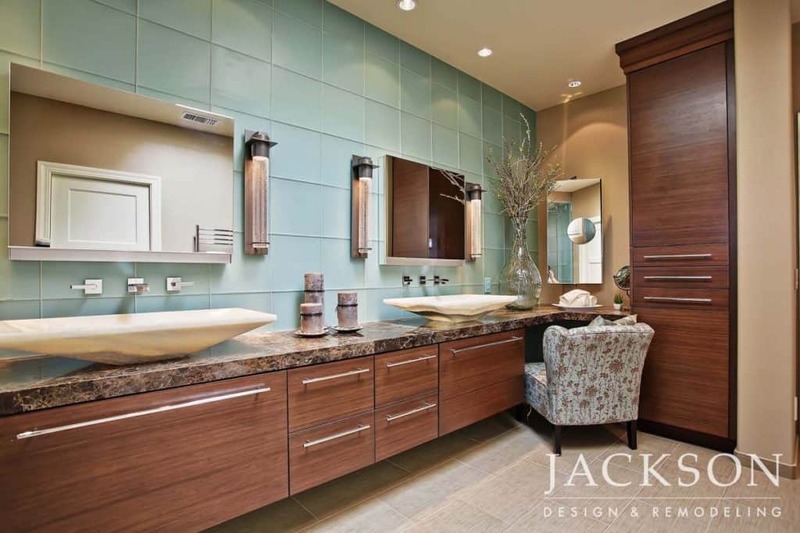 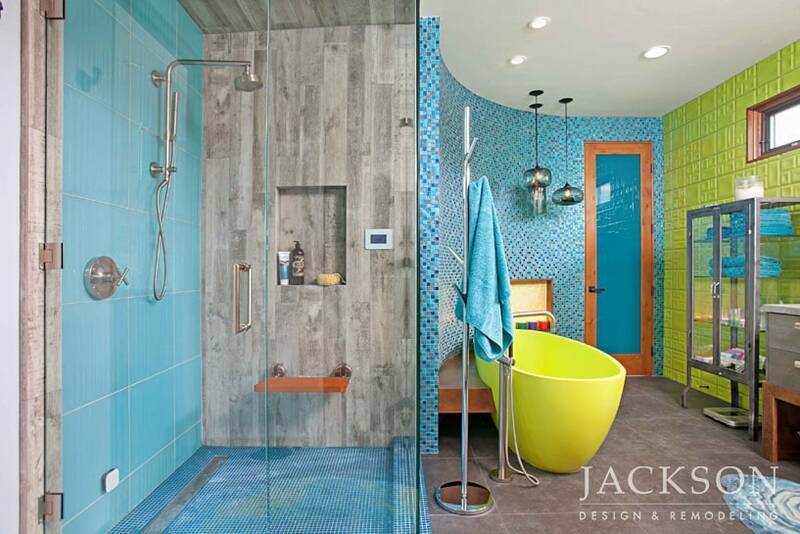 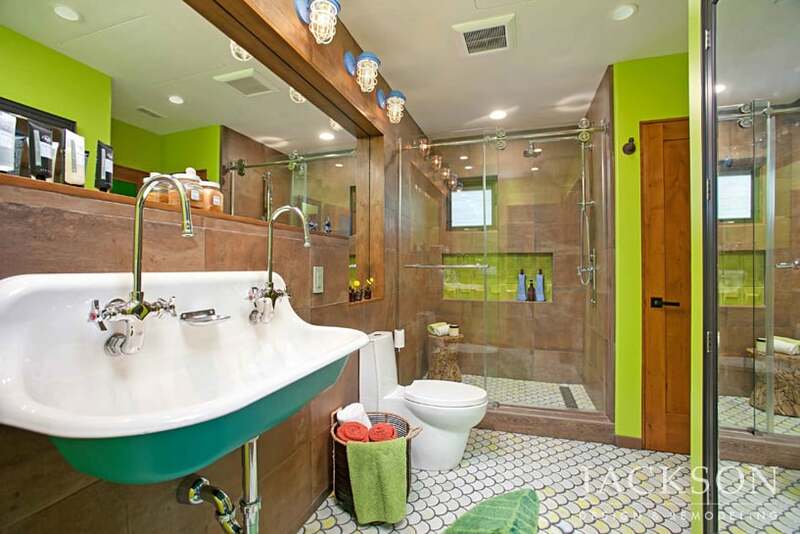 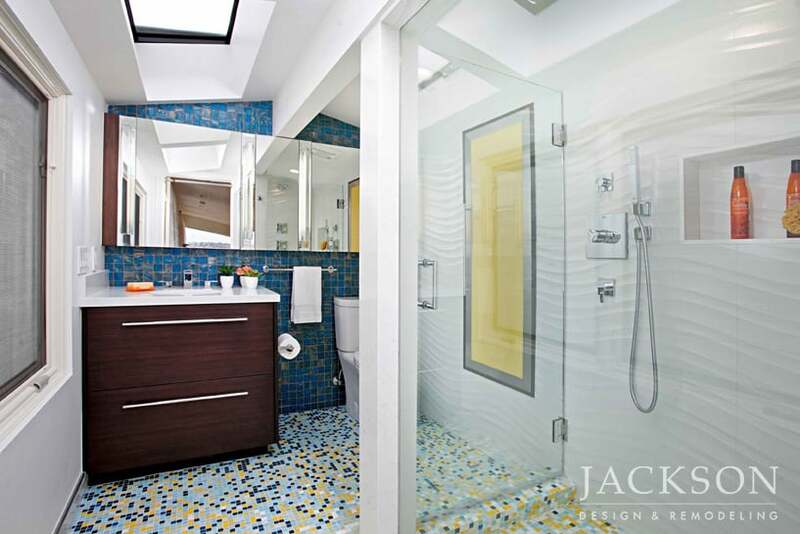 Playful color and artistic details distinguish this master bathroom with energy and sophistication. 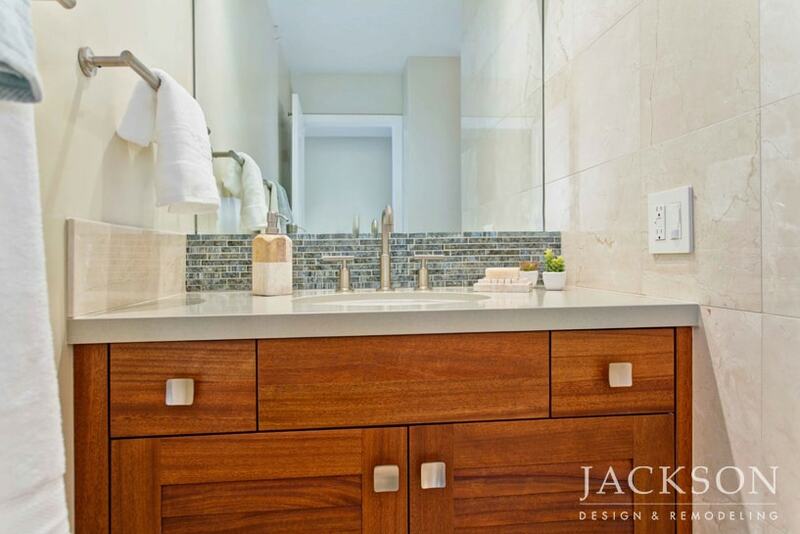 Clean horizontal lines add a visual sense of balance and order along with generous storage. 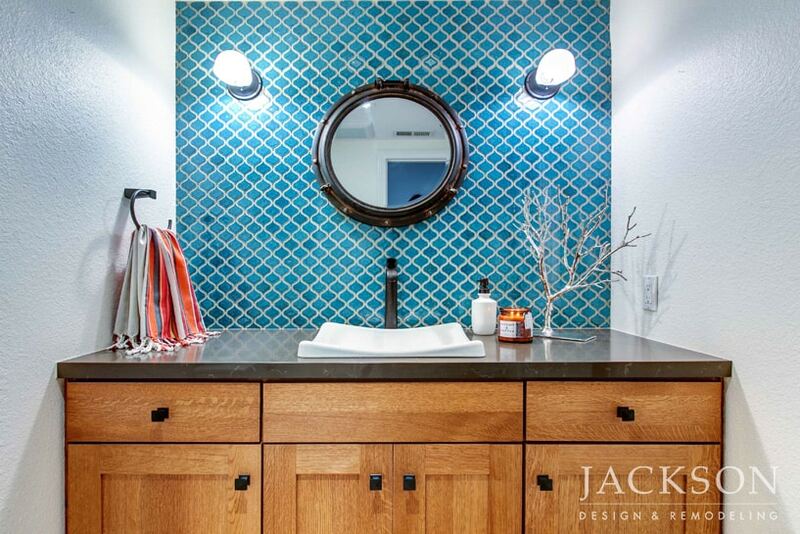 Vivid color and a hint of nautical make a splash in the powder room of this cottage-like home near the beach. 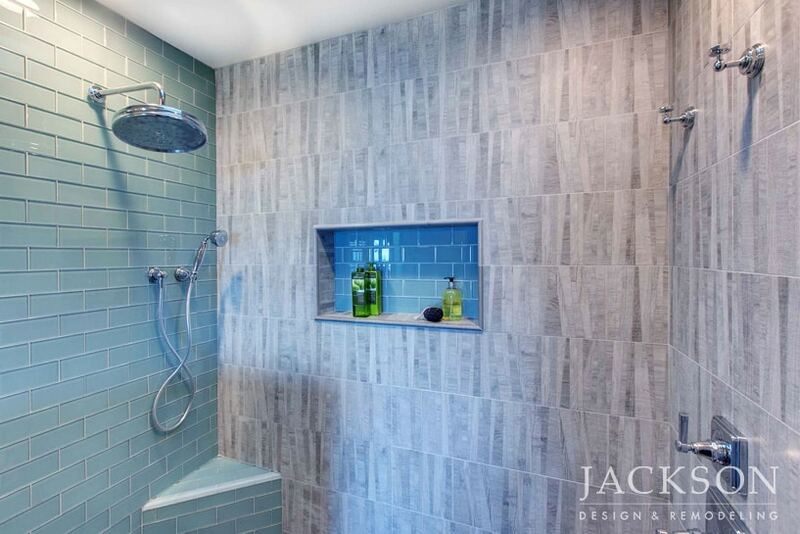 Alternating shades of blue and subtle textural changes evoke the surface of rippling water on the tile wall. 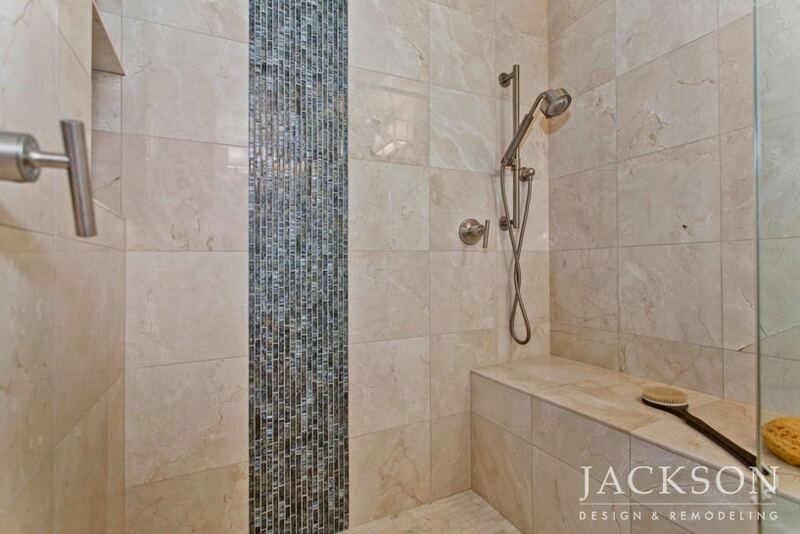 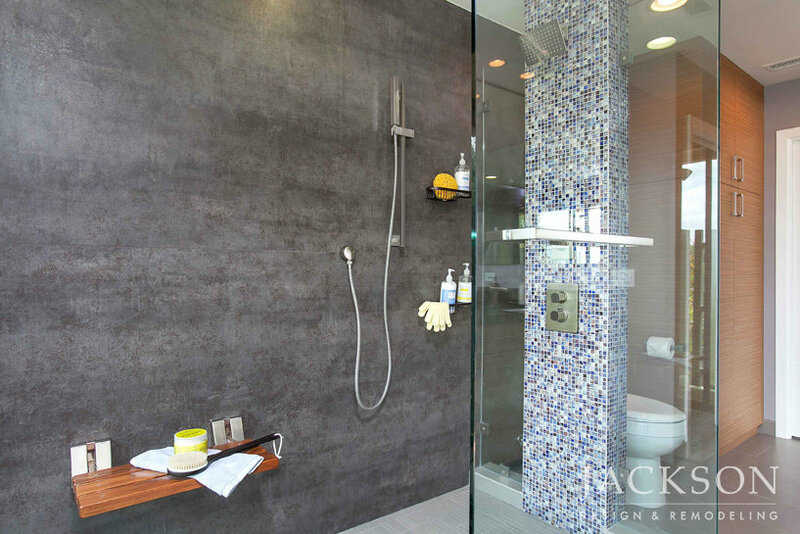 Glittering mosaic tile lends lush detail to the spa-style shower in the master bathroom of a waterfront condo. A floating toilet with its tank inside the wall is an innovative solution to limited space. 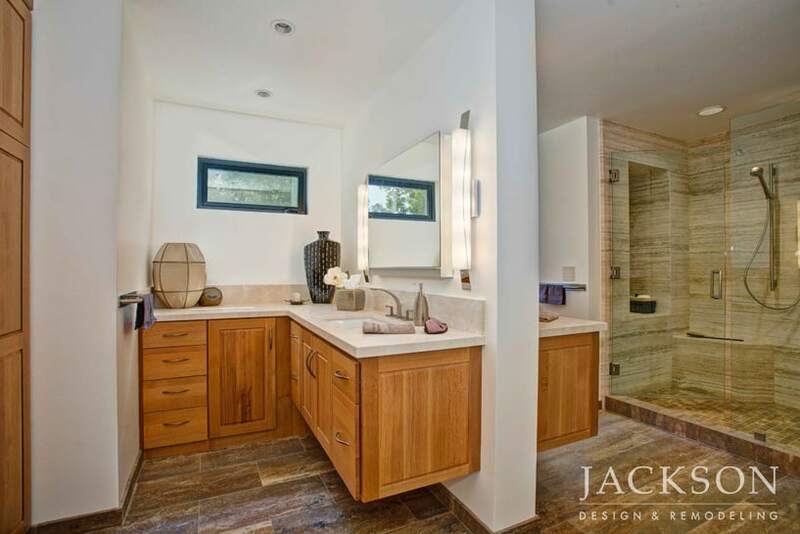 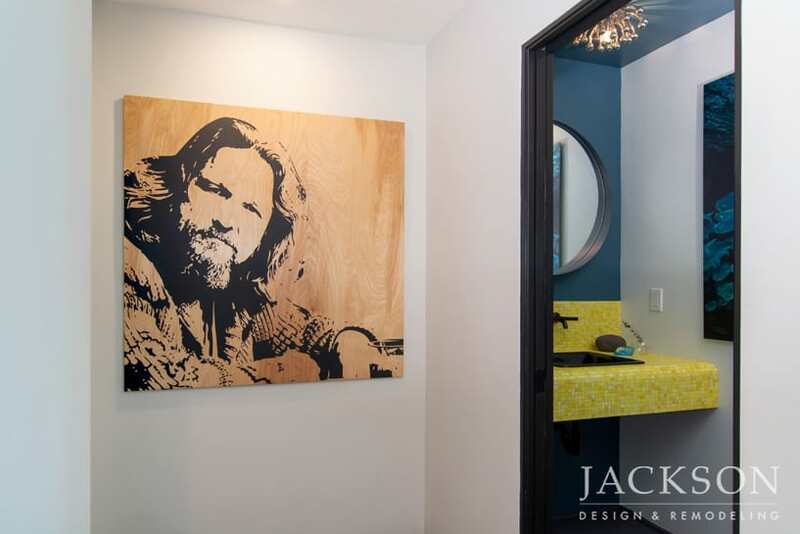 A mountaintop home with stunning natural surroundings is the setting for this award-winning powder room, which makes a lasting impression with limited space. 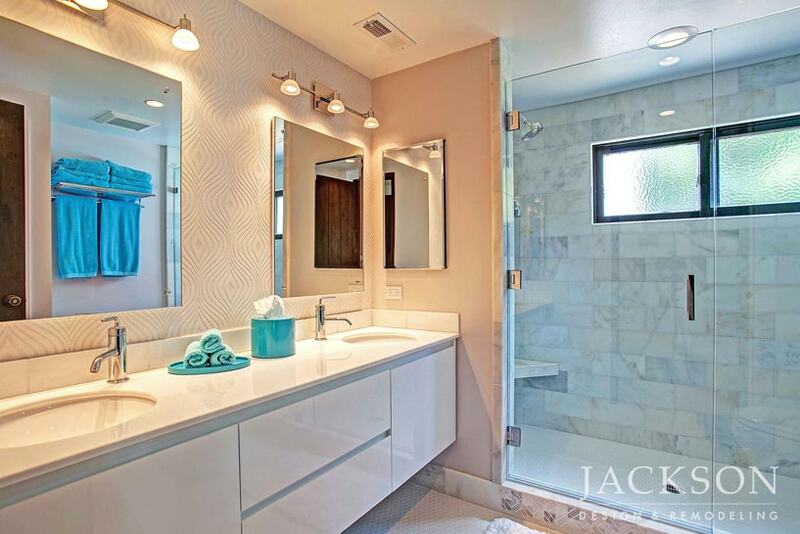 Design inspired by the desert adds elements of light, interest and surprise. 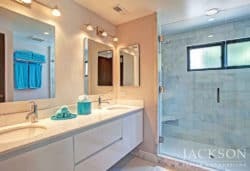 In a bathroom for the clients’ visiting parents, universal design elements, such as bright adjustable lighting, provide ease-of-use while aligning with the overall home design. 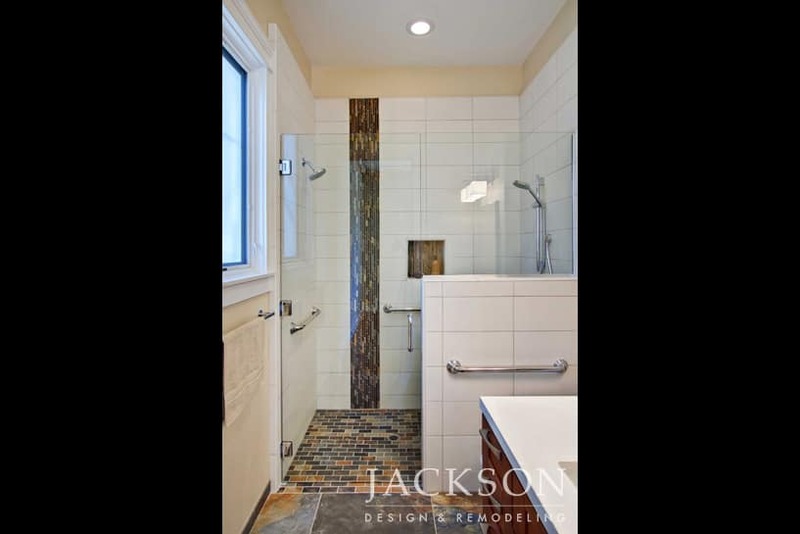 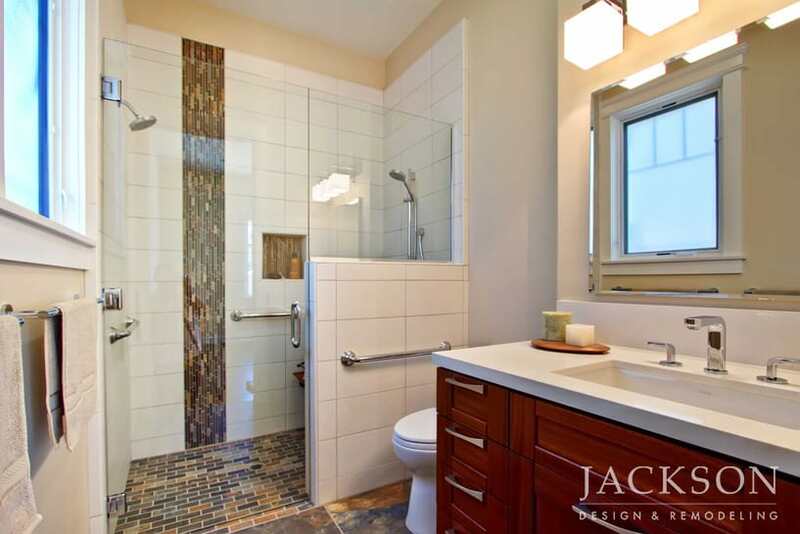 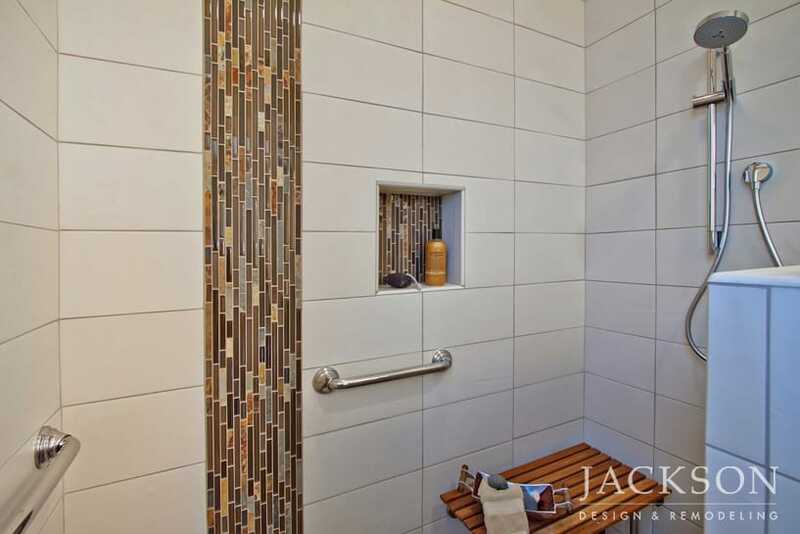 The walk-in shower easily accommodates a walker or wheelchair. 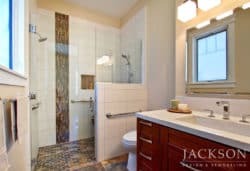 The clients for this bathroom were “empty-nesters” who wanted to spoil themselves with something completely different from the bath they had lived with for twenty years. 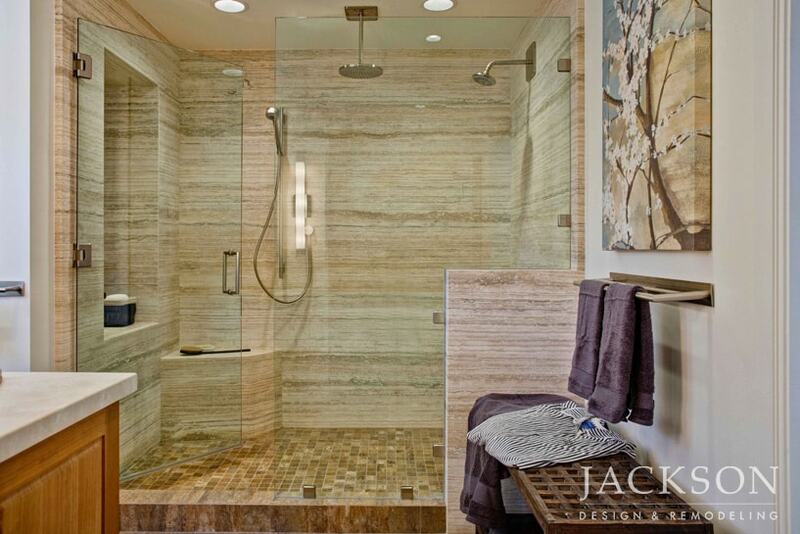 This serene, award-winning space is evocative of a Zen-like spa. 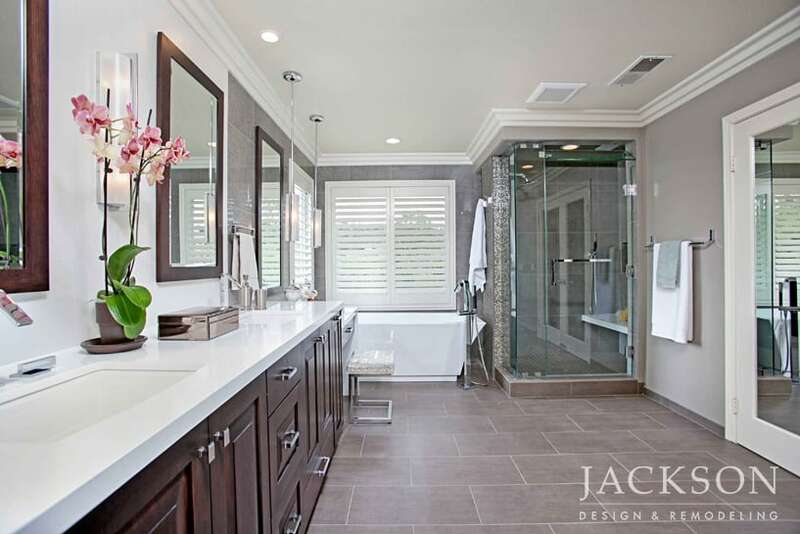 This award-winning master bathroom blends the differing needs of the clients by starting with luxury and finding innovative ways to introduce universal design. This tranquil space achieves its dual purpose of refreshing sanctuary and universal access. 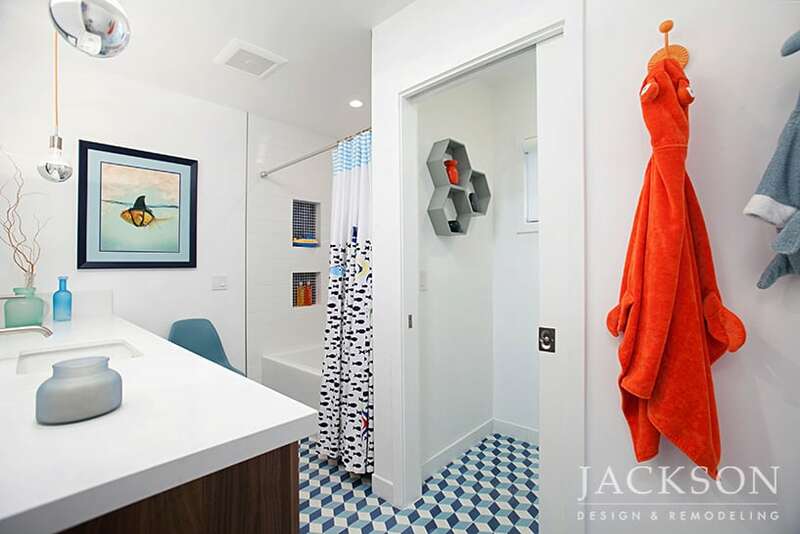 For a family remodeling their whole home with a Mid-Century Modern sensibility, the kids’ bathroom is practical yet playful. 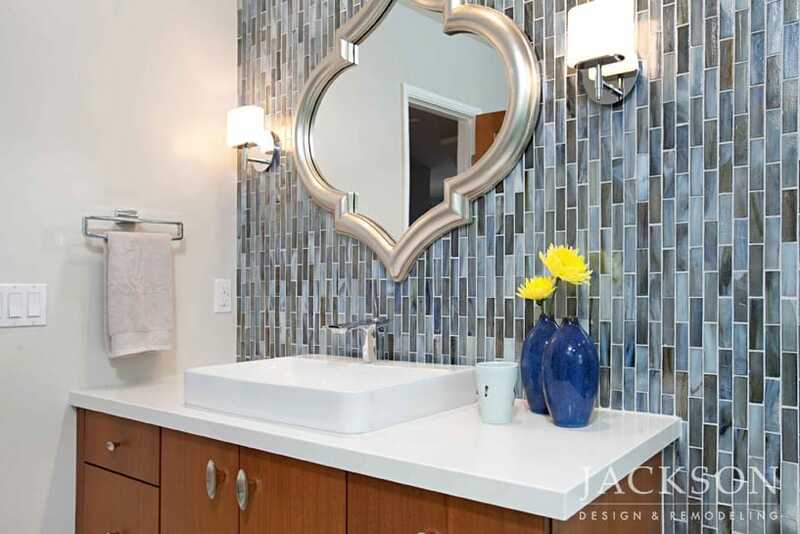 Marble tile and wallpaper reminiscent of the 1960s complement a design that is stylish yet durable. 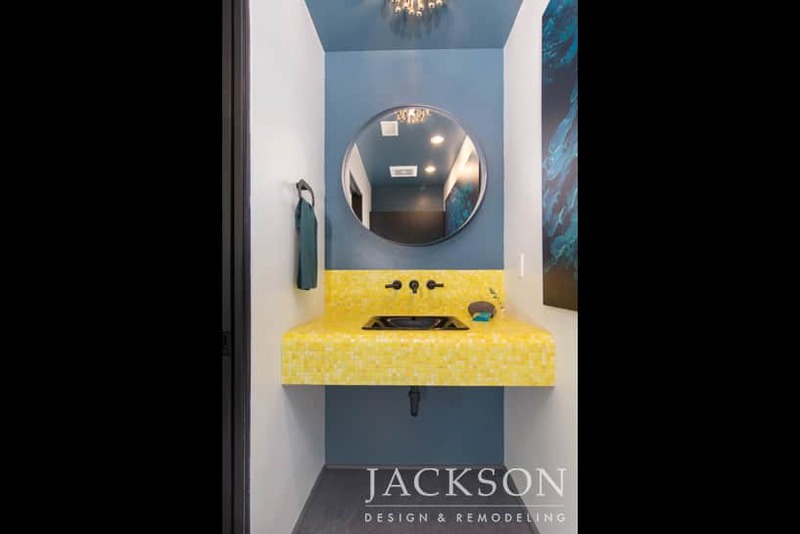 In a home designed with cutting edge contemporary design, this small, award-winning powder room makes a definitive design statement. 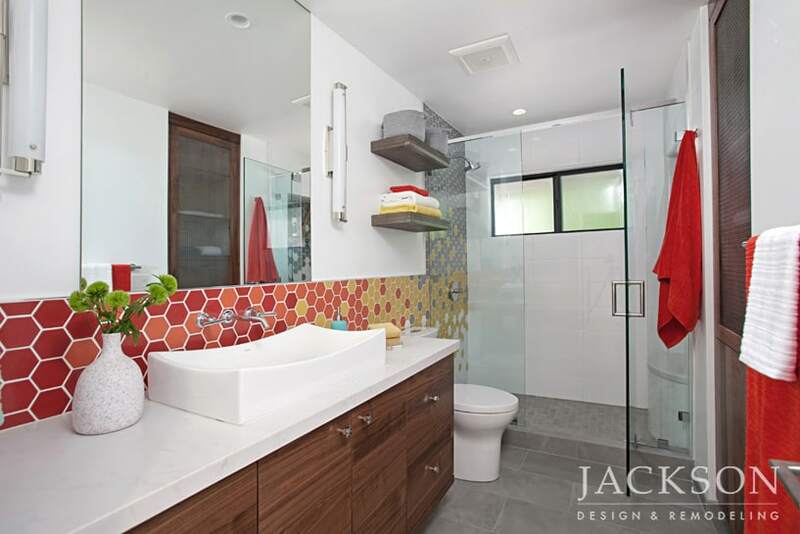 Interesting textural choices and a trio of red tile insets are striking visual choices. 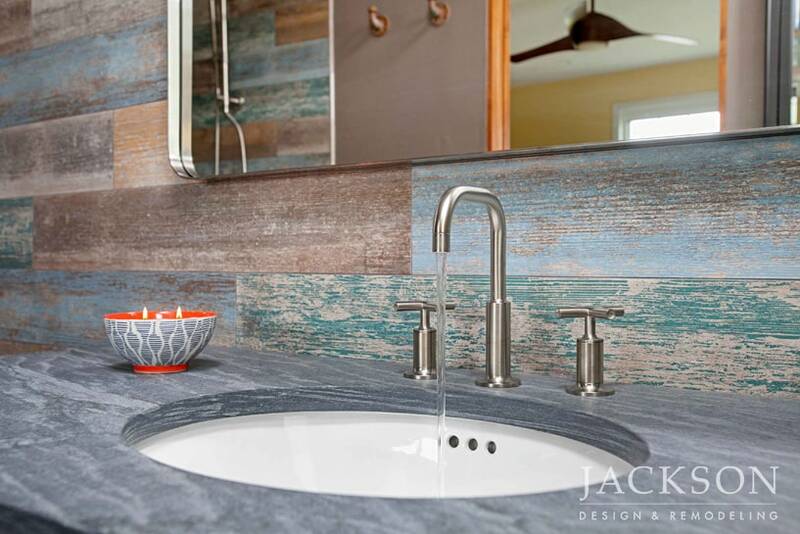 A vibrant vessel sink glows against quartz countertops and wall tiles with a backdrop of cool blue. 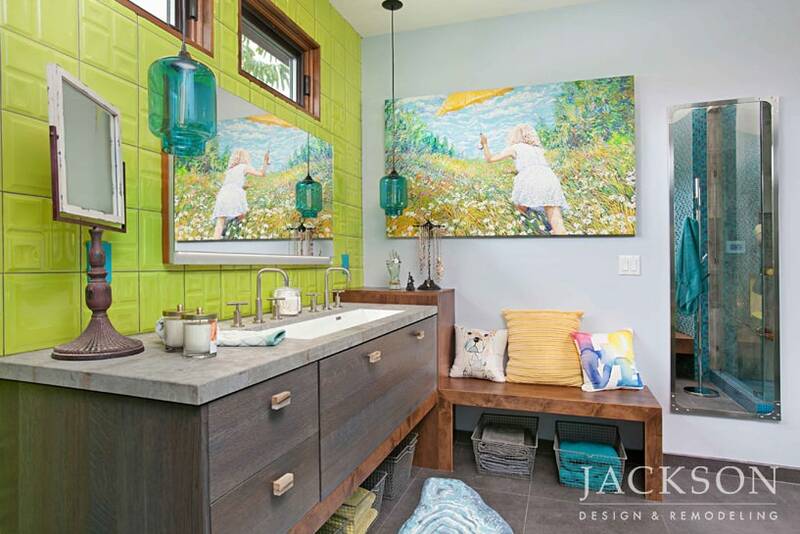 The unusual color scheme is the perfect setting for the artistic clients’ eclectic pottery collection in this award-winning bathroom. 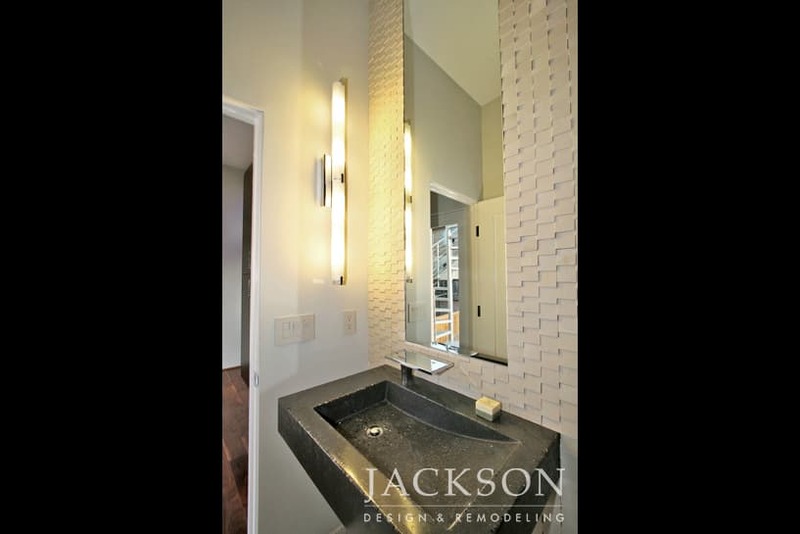 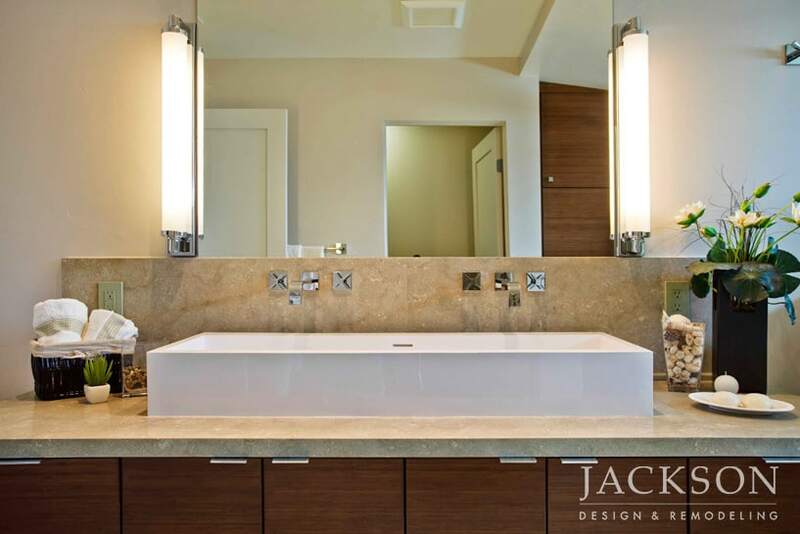 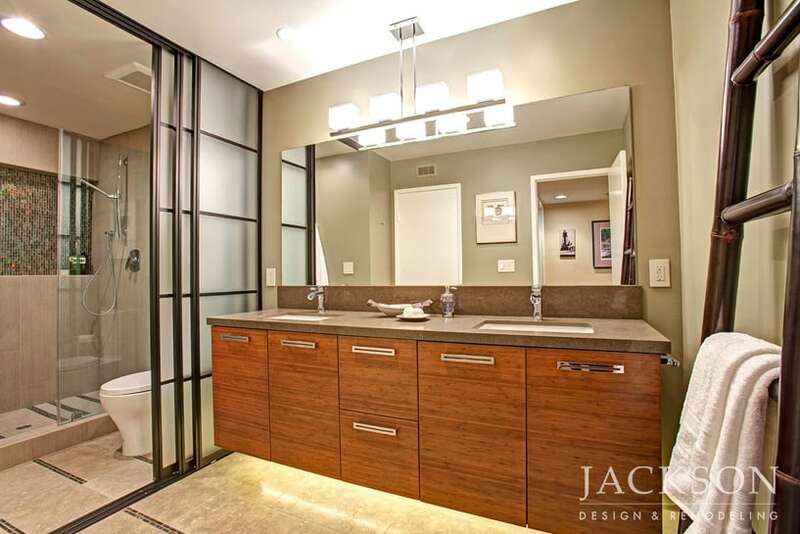 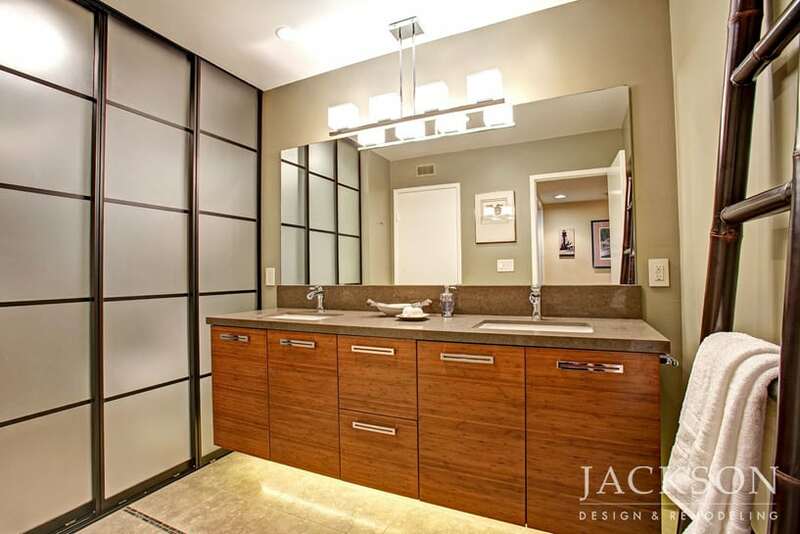 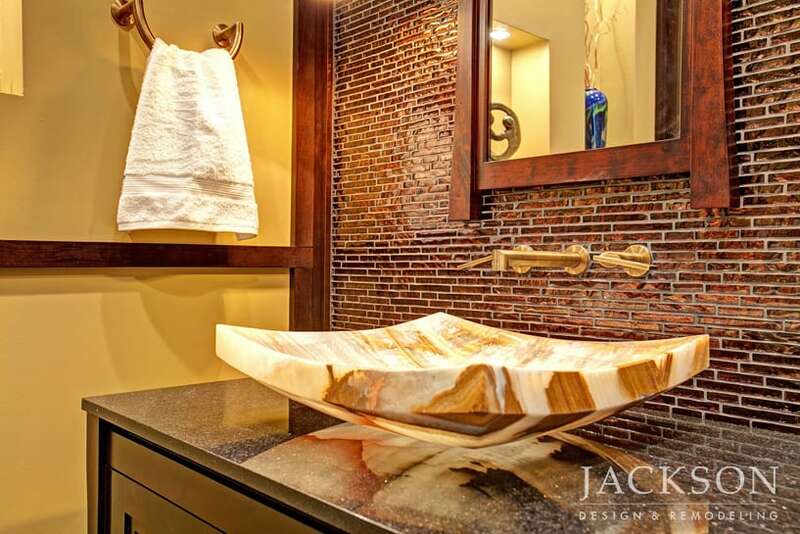 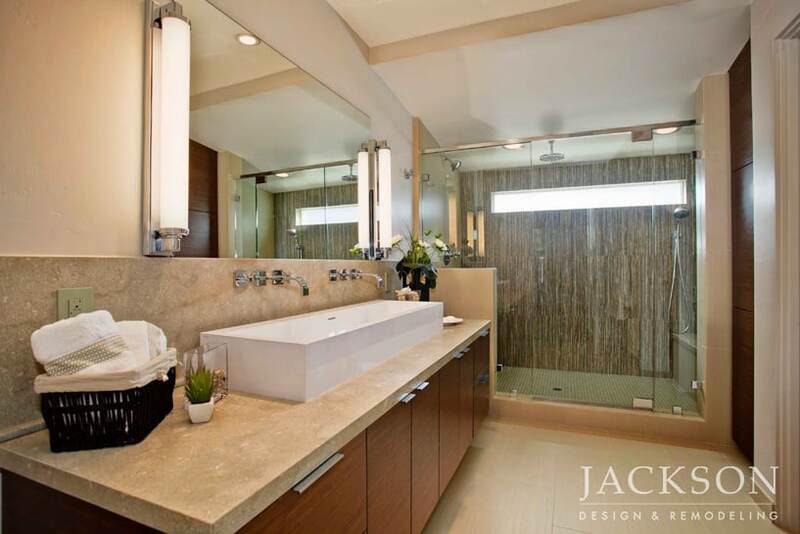 The “trough” sink in this sleek master bathroom is a stylish alternative to the standard “his and hers”. 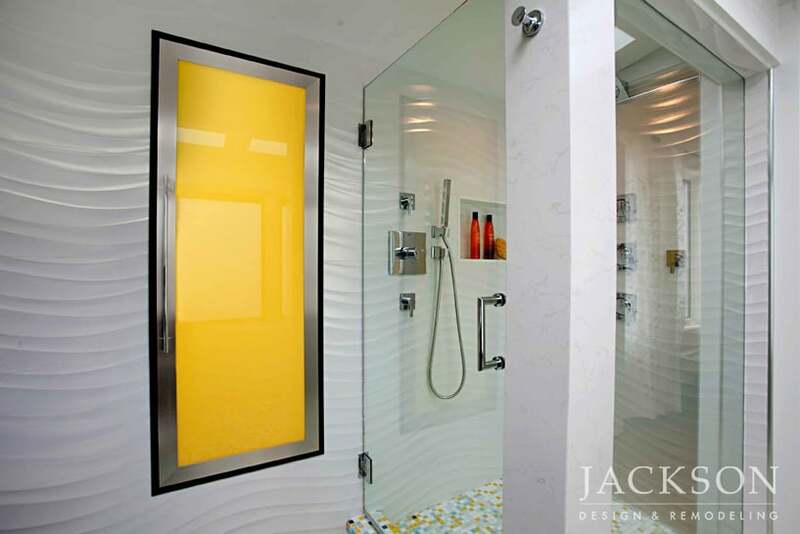 Its shape is reflected in the shower window, which lets in abundant light while allowing for privacy. 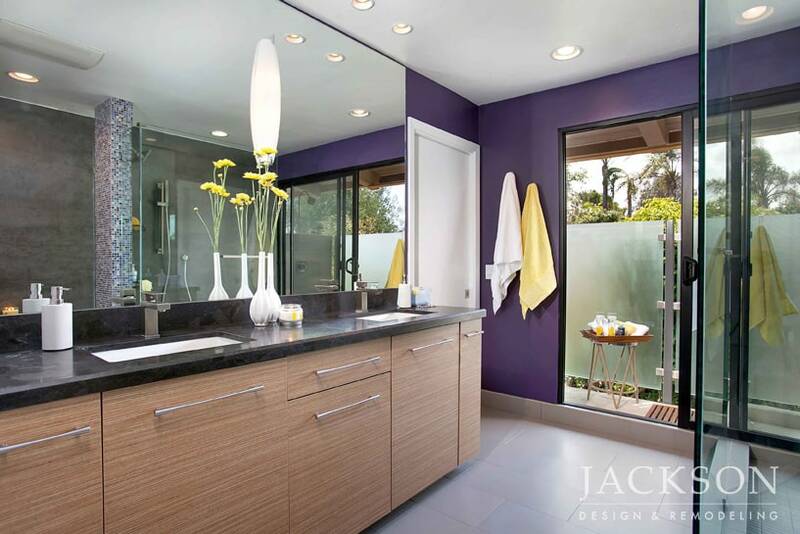 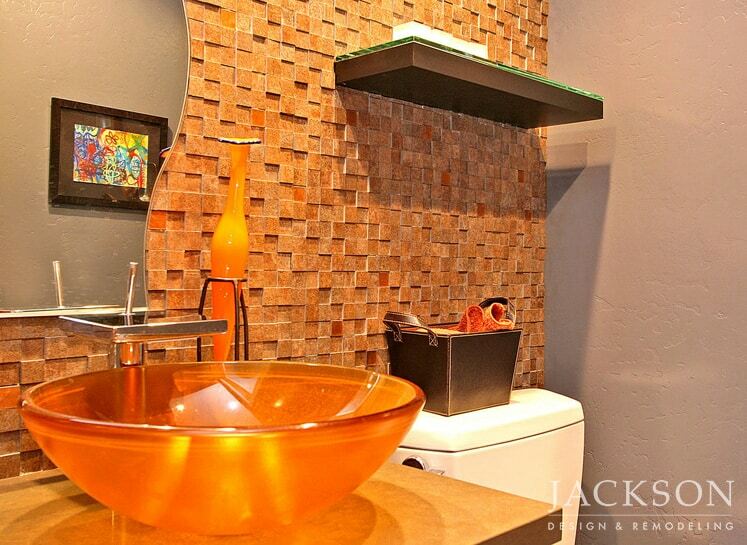 Modern glamour welcomes visitors with sleek lines, rich colors and compelling textures in this small powder room. 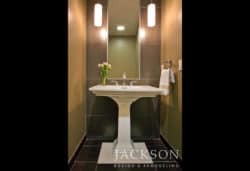 White inlay under the pedestal features white pebbles, in studied contrast with the sensuous dark chocolate floor tile. 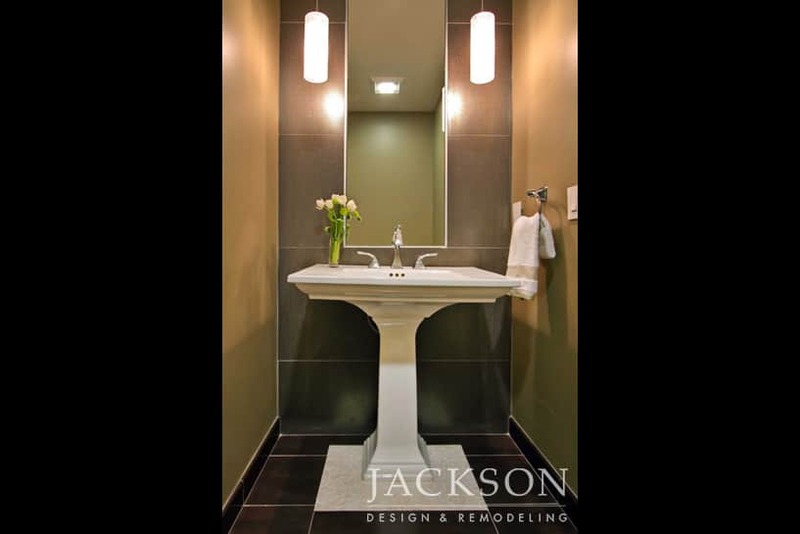 Our expert design team helps your explore all the possibilities for your custom bathroom from contemporary to traditional. 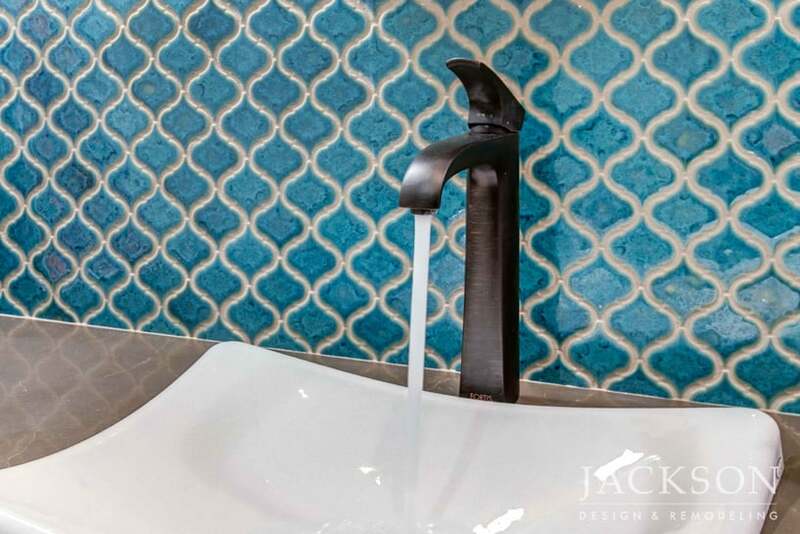 Guided through options and innovations, you’ll be inspired by the possibilities!